What on Earth, right? 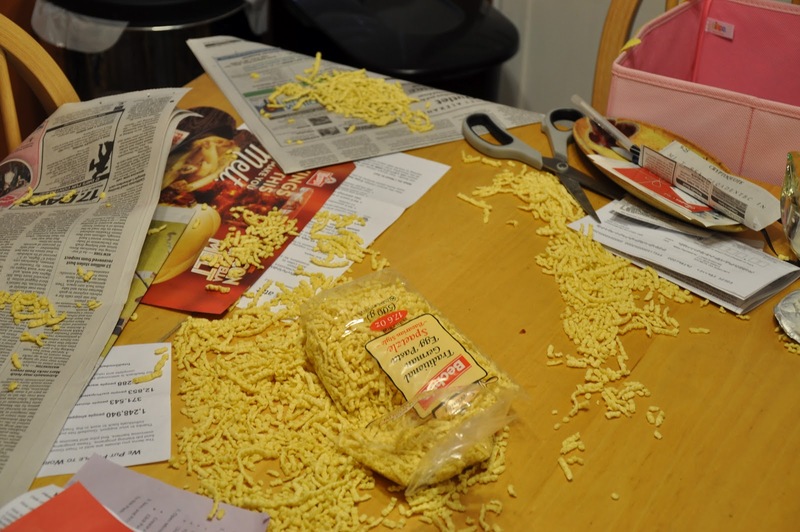 Read on to find out who or what had a Spaetzle fight in my dining room. What is the sure-fire signal that autumn is upon us? Squash cooking, roasting, baking, stewing, grilling, or showing up in any form in our household cooking. 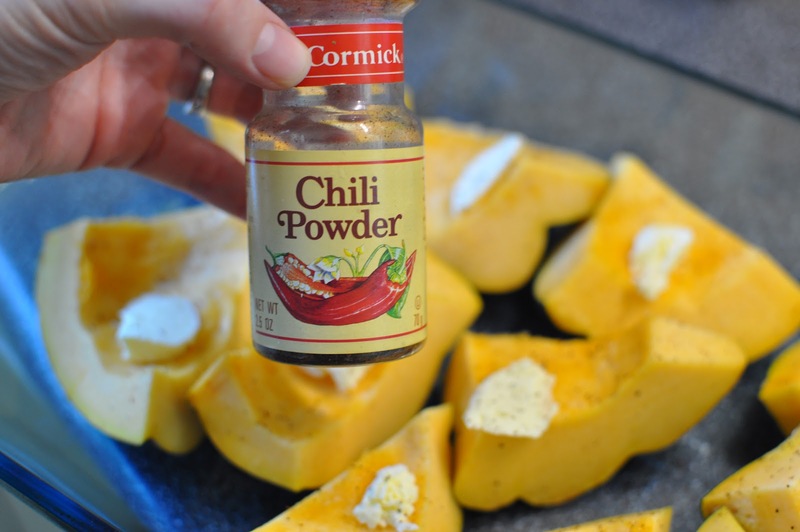 I diced up my squash, added tabs of margarine, and sprinkled with chili powder. Bake them in a 9 x 13 inch dish for 30 minutes at 375 degrees. Meanwhile, I boiled a large pot of salted water for my Spaetzle. 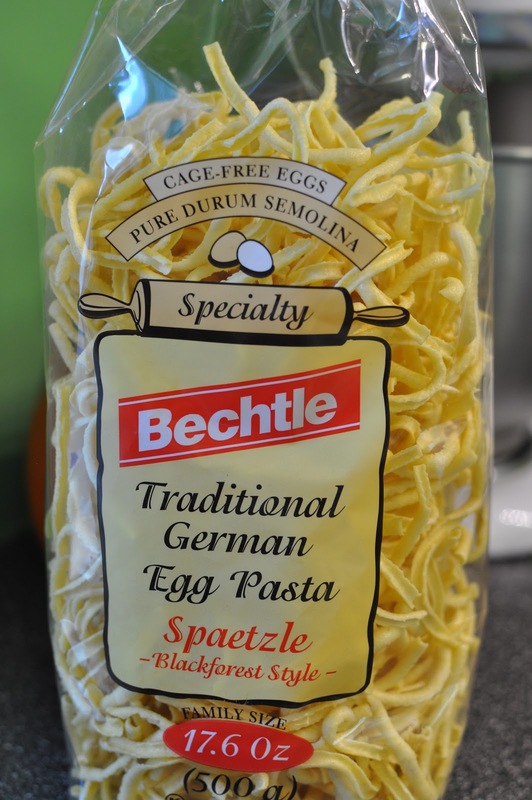 I love this German egg pasta! 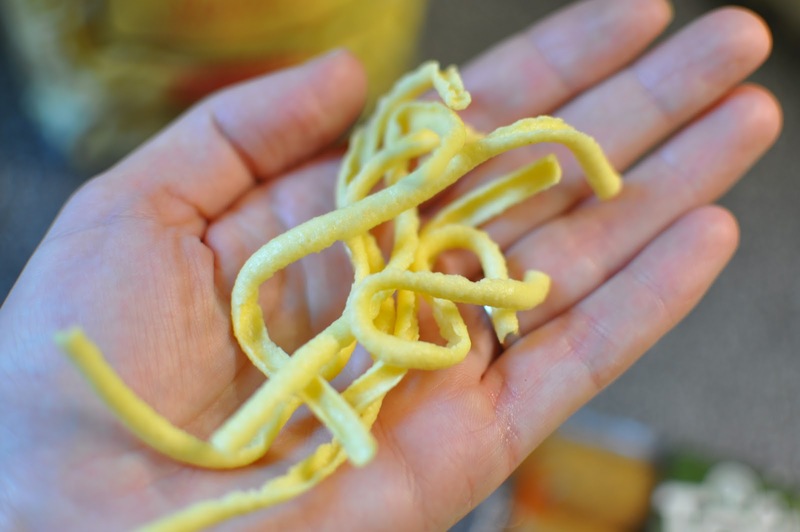 It starts off curly and after cooking becomes this meaty, soft, filling pasta. It’s hard to have one serving of this pasta. Cook for 15 to 17 minutes til soft. For the sauce, sauté butter and onion for about 5 minutes or until softened. Add 1/2 cup almond milk and salt and pepper to taste. 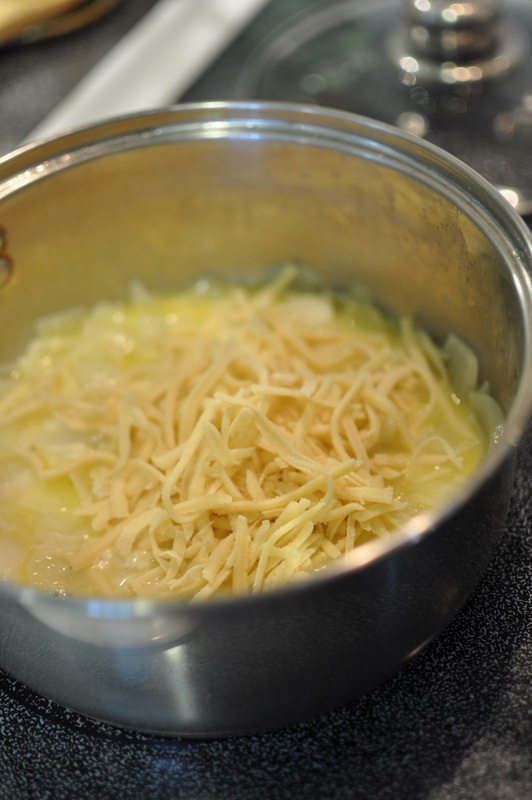 Add two handfuls of shredded cheese. I used rice cheese tonight instead of the sharp cheddar that we sometimes use. Next, microwave these bad boys. 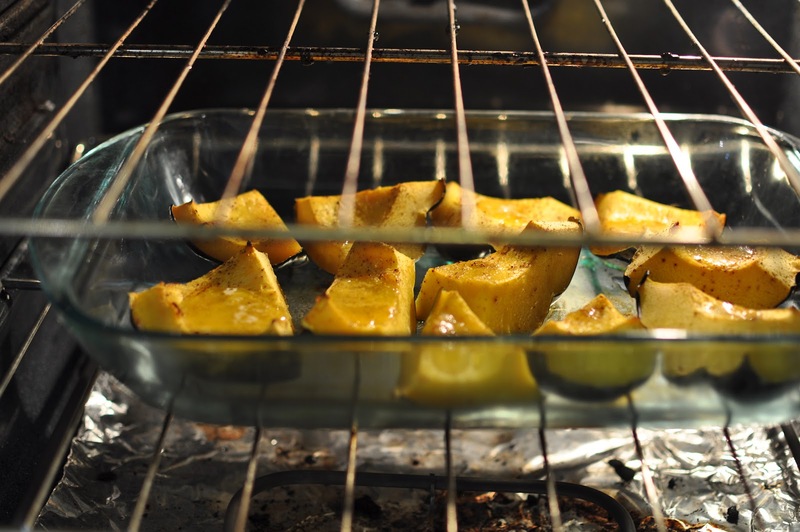 By now the squash should be perfectly cooked and making your entire house smell peppery. 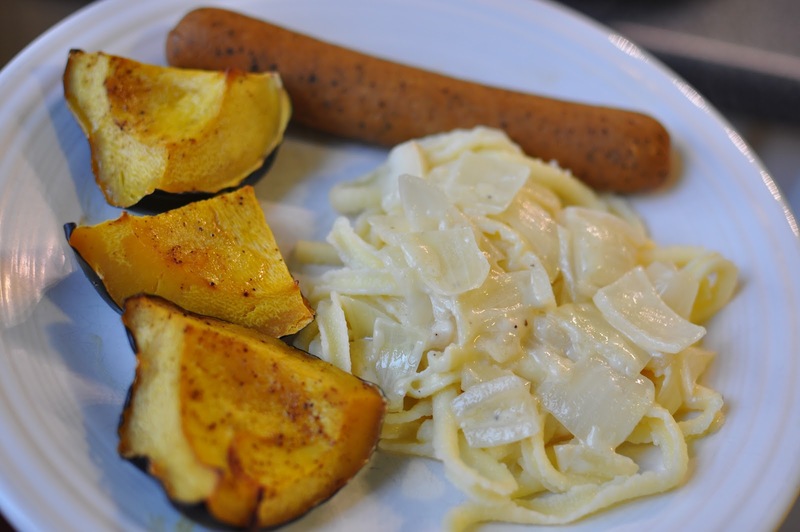 Everything in this autumnal meal came together perfectly. All it needed was a solid autumnal beer. I would have loved to plan ahead and Skyped my German sources, alas it was far too late for all of you! leaving a bag of unsupervised Spaetzle out all day attracts nasty little cats. There are only 8 lives left on this cat. I bet his little tummy hurts tonight! 1. 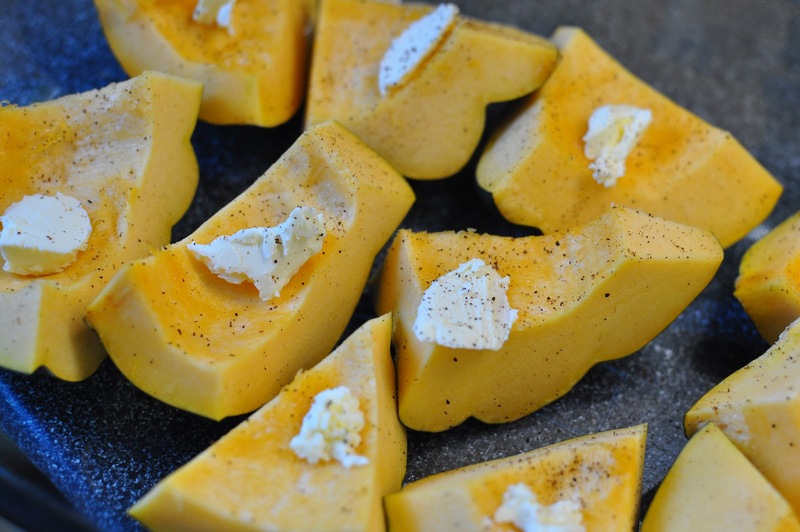 Slice acorn squash, scoop out seeds, and place in 9 x 13 inch baking pan. Fill holes with dabs of butter or margarine, sprinkle with chili powder. 2. Bake in a 375 degree oven for 25 to 30 minutes or until soft. 1. Boil large pot of salted water. Add pasta and cook for 15 to 17 minutes til soft. 3. 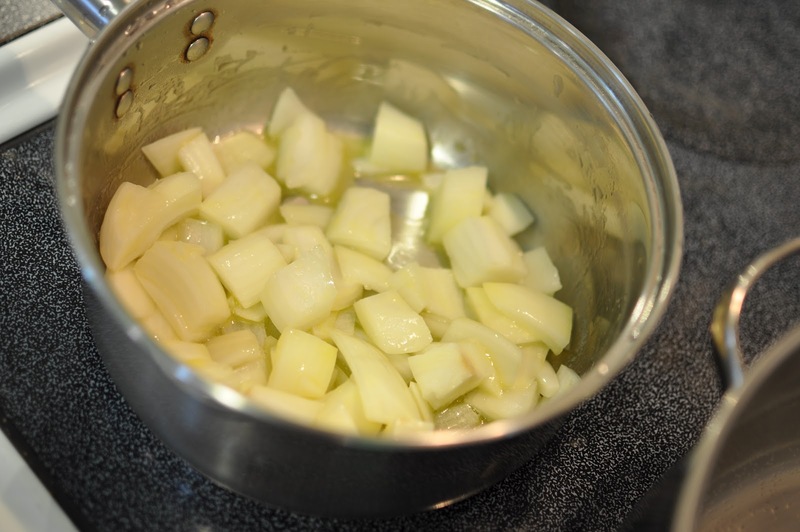 For sauce, saute 2 tablespoons of butter and 1/2 a yellow onion. Salt and pepper to taste. Add 1/2 cup milk and 2 handfuls of shredded cheese. Cook on low until thick and bubbly. 4. Serve sauce on top of cooked Spaetzle with a side of sausage of your choice. The world’s most perfect dessert: chocolate chip cookies. 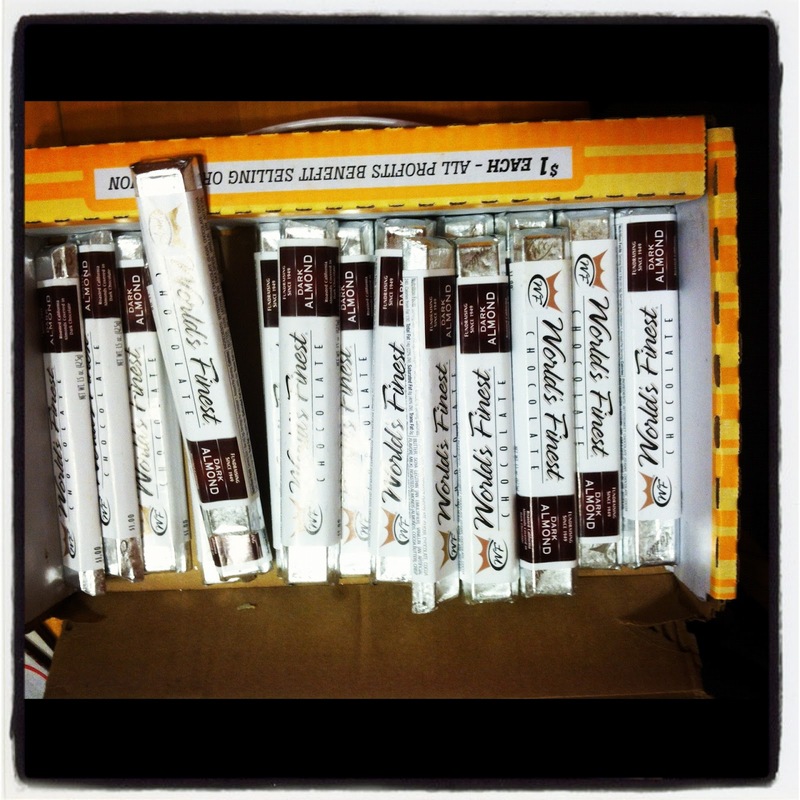 What to do when you are given an entire box of stale almond milk chocolate bars? Chop them up to use in cookies, of course! I still always use the recipe on the back of the Nestle Toll House chocolate chips bag. Why mess with a good thing? 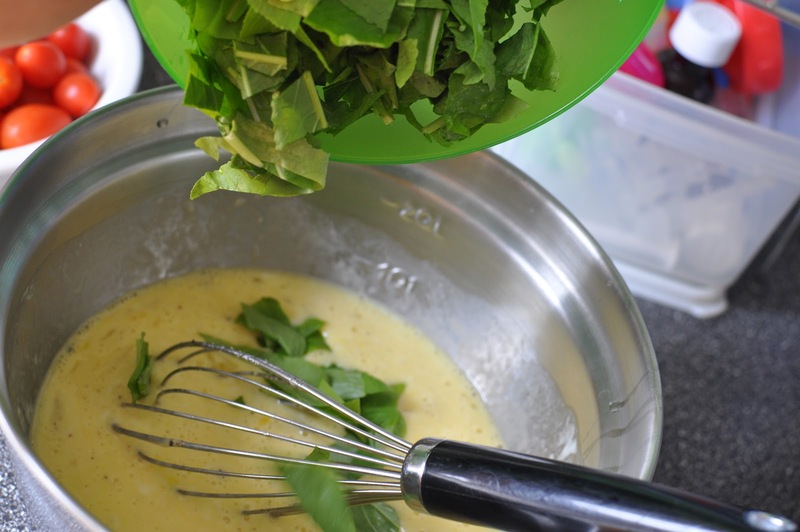 Use an electric beater or mixer stand to cream the butter, sugars, eggs, and vanilla. Mix in the 2 cups of chopped almond chocolate bars. Cover the dough and allow it to sit in the refrigerator at least overnight. 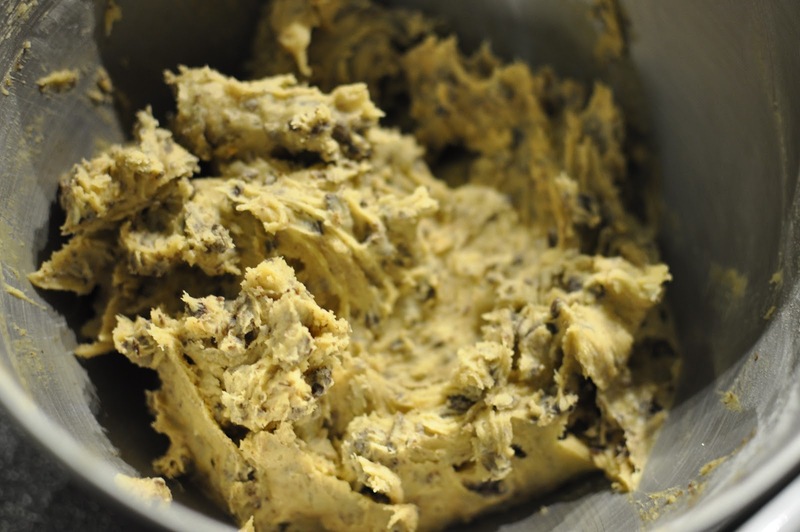 However, if you can bear it, 36 hours is the perfect amount of refrigerator time for chocolate chip cookie dough. This allows the eggs and butter to really combine with the dry ingredients and create a drier and firmer dough, and as it turns out, this type of dough bakes more consistently. This technique is even used by Toll House themselves, but left out of the original recipe from the 1930s. This original recipe comes from Mrs. Wakefield, owner of Toll House Inn, in Whitfield, Massachusetts, who did in fact refrigerate her dough before baking it. 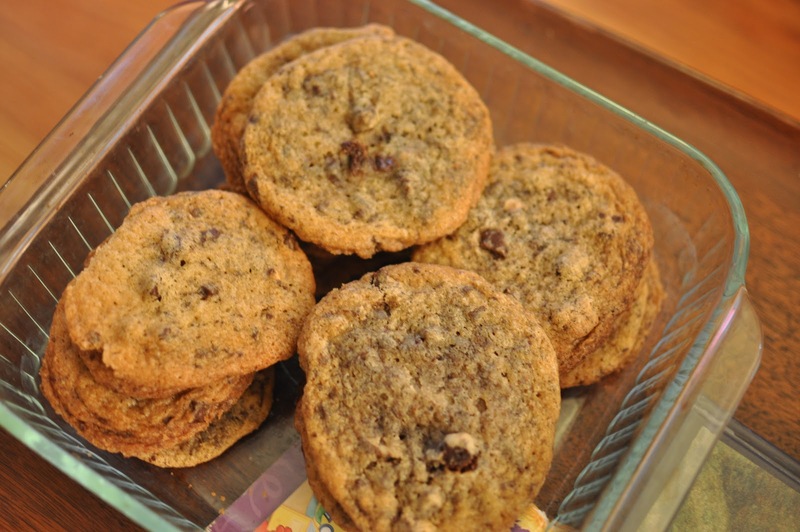 Read the full account on how to make the perfect chocolate chip cookie and its history, here at the New York Times article, Quest for the Perfect Chocolate Chip Cookie, by David Leite. Preheat your oven to 375 degrees. Drop cold, rounded spoonfuls of the dough onto a baking sheet and bake at 375 degrees for 9 to 11 minutes or until golden brown. 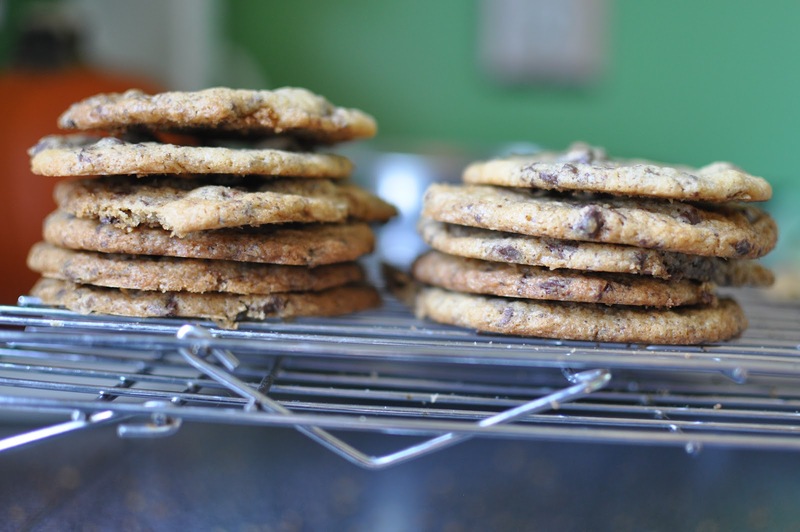 Allow the cookies to cool for 2 minutes on the baking sheets, and then transfer them to a wire rack to cool completely. However, I still think these cookies must be enjoyed warm. These cookies went with me to work last Friday to be shared with colleagues. In a small bowl, combine 2-1/4 cups all-purpose flour and 1 teaspoon baking soda. Beat 1 cup (2 sticks) of butter, 3/4 cup granulated sugar, 3/4 cup packed brown sugar, and 1 teaspoon vanilla in a large mixer bowl until creamy. 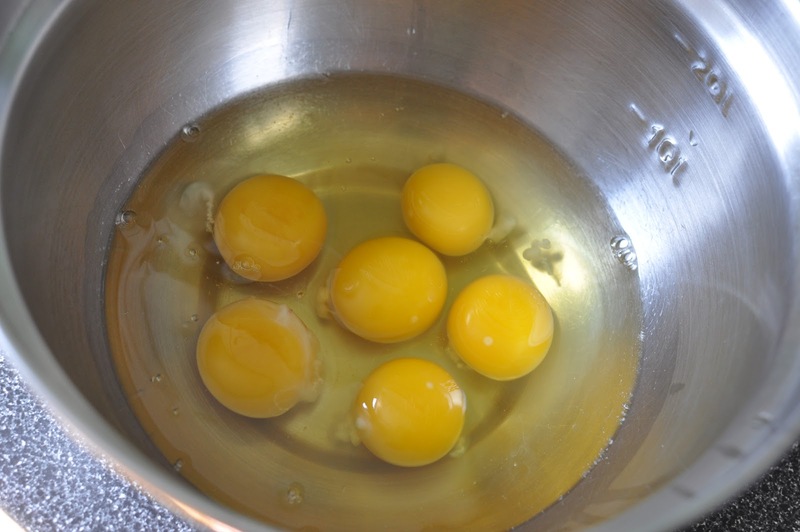 Add 2 large eggs, 1 at a time, mixing well after each addition. Gradually beat in flour mixture. 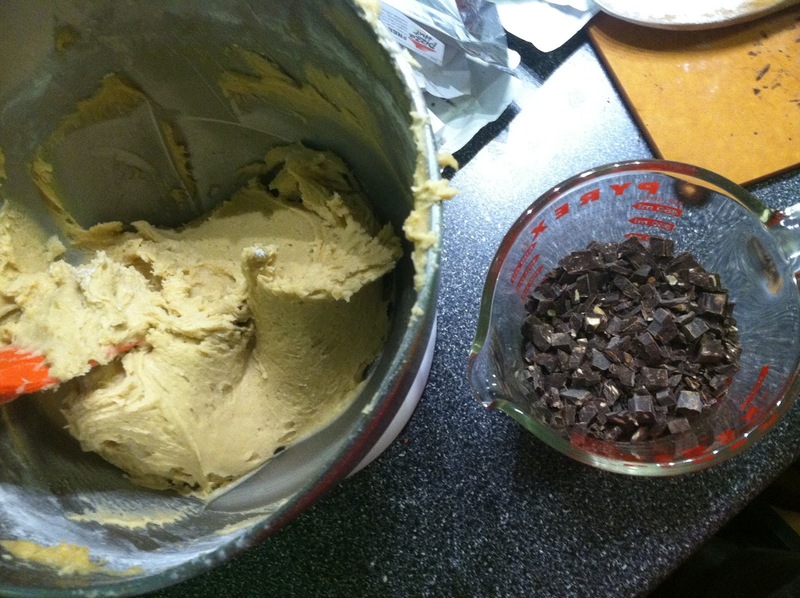 Mix in 2 cups of chopped almond candy bars (or 2 cups chocolate chips). Preheat oven to 375 degrees. 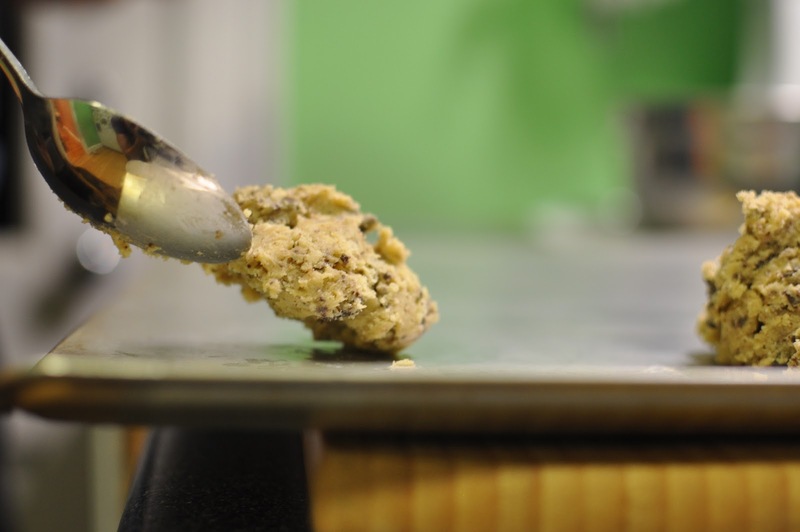 Drop rounded spoonfuls of dough onto cookie sheets. Bake for 9 to 11 minutes, or til golden. Cool on baking sheets for 2 minutes and then remove to wire racks to cool completely. A perfect example of a Mommy’s Medley square meal. 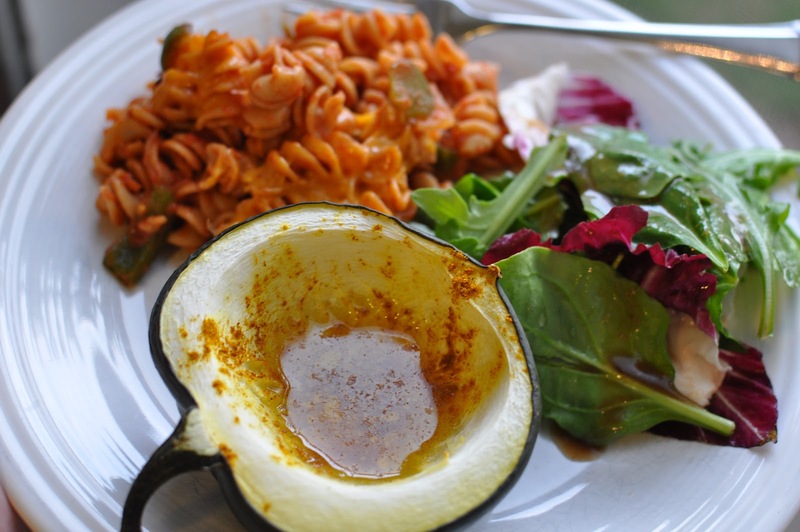 Roasted curried acorn squash, chipotle tomato pasta bake, and a mixed greens salad. 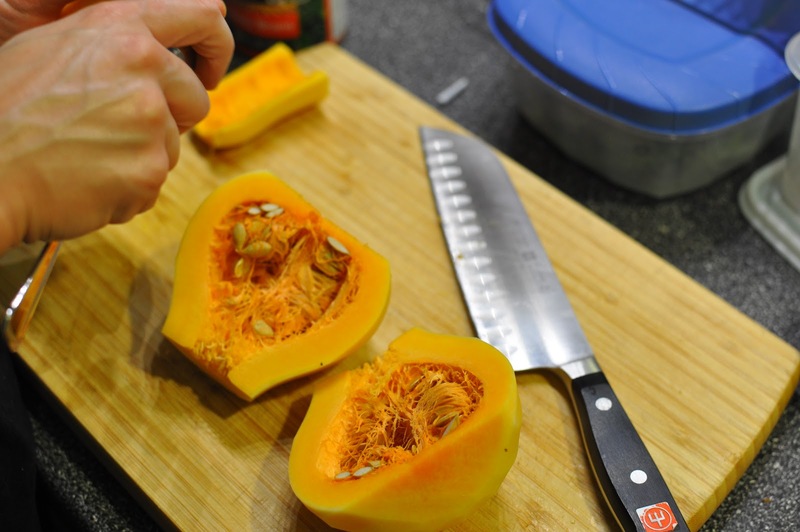 Start with your acorn squash, this way the squash has time to bake while you prep and bake the pasta. This particular squash is out of my garden. 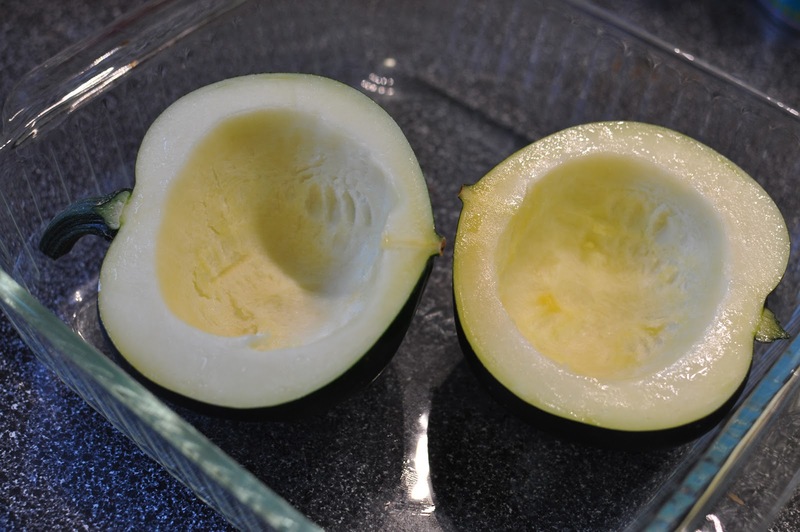 Cut 1 acorn squash in half, scoop out the innards, and place in a square glass baking dish. 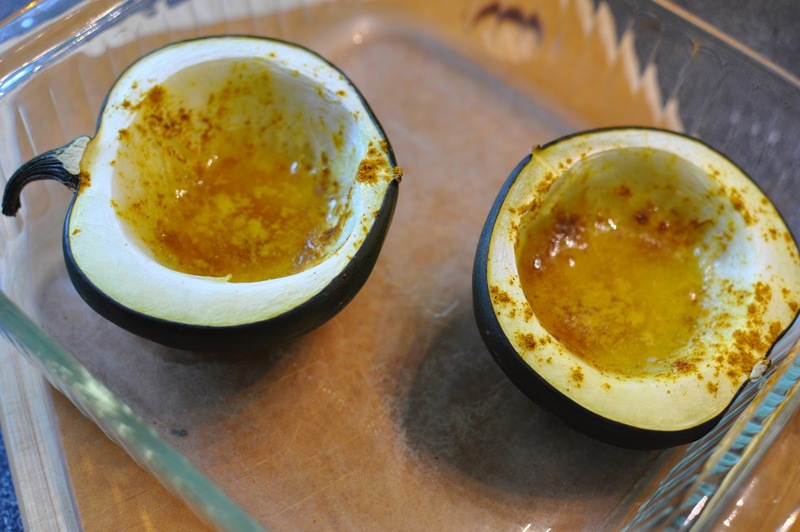 Fill the inside of the of squash with whatever spices you like and 1 tablespoon of butter or margarine per squash half. I used Smart Balance margarine and powdered curry as my fillings. Add about an inch of water to the bottom of the pan. Bake in a 425 oven for 35 to 40 minutes or til soft. 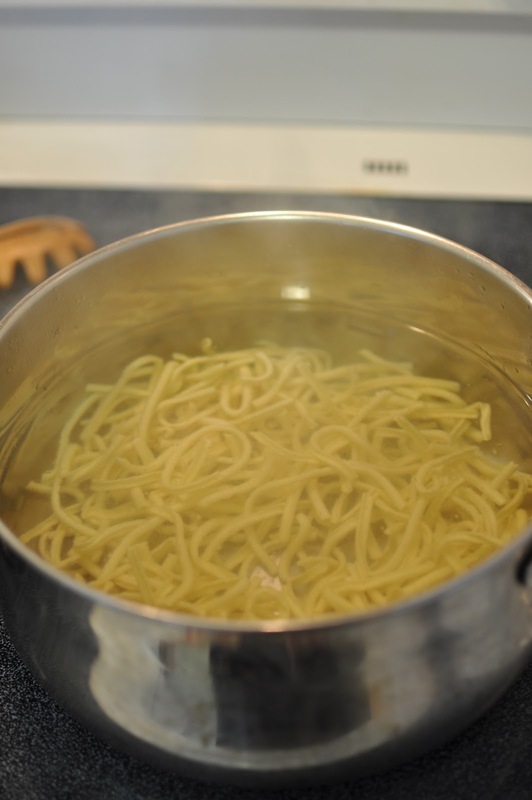 For the pasta bake, start by boiling a 16 oz box of pasta. Cook according to the directions on the package. I used whole wheat rotini this time around. 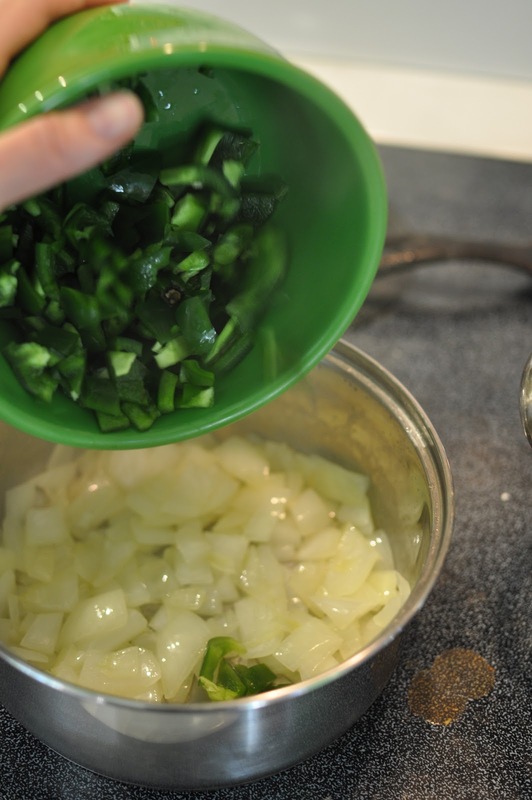 Meanwhile, in a medium sauce pan, saute 1/2 of a diced yellow onion, and 1 diced green bell pepper in 1-2 tablespoons olive oil for 5 minutes or til soft. For the sauce, mix 12 oz of tomato sauce, 1 cup of milk, 3 oz of tomato paste (about 1/2 the can), 2 cloves of minced garlic, and fresh ground pepper, to taste. Drain the cooked pasta and place in a large oven safe baking dish. Add the sauce mixture, mix well. 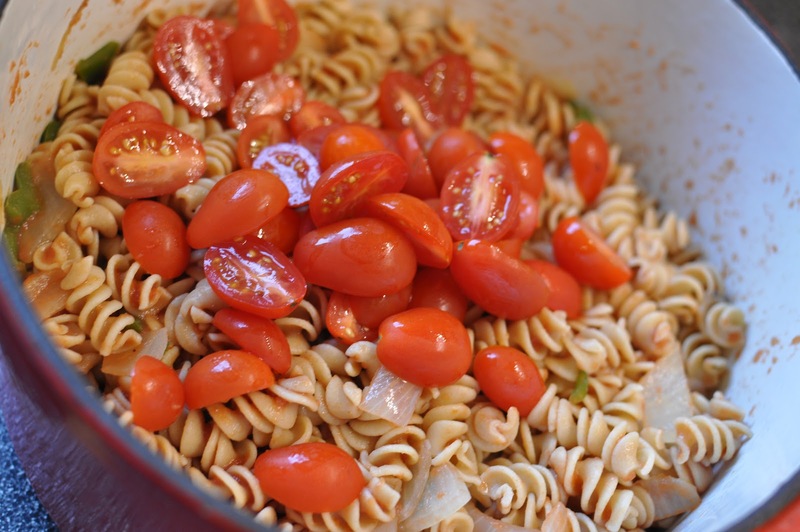 Slice grape tomatoes in half – I used a half a carton and add to the pasta mixture. For a little extra spice, I added 3 chipotle peppers. These babies pack an amazing amount of hot smoky flavor in a small amount of pepper. Slice up 3 chipotle peppers and add to pasta mixture. 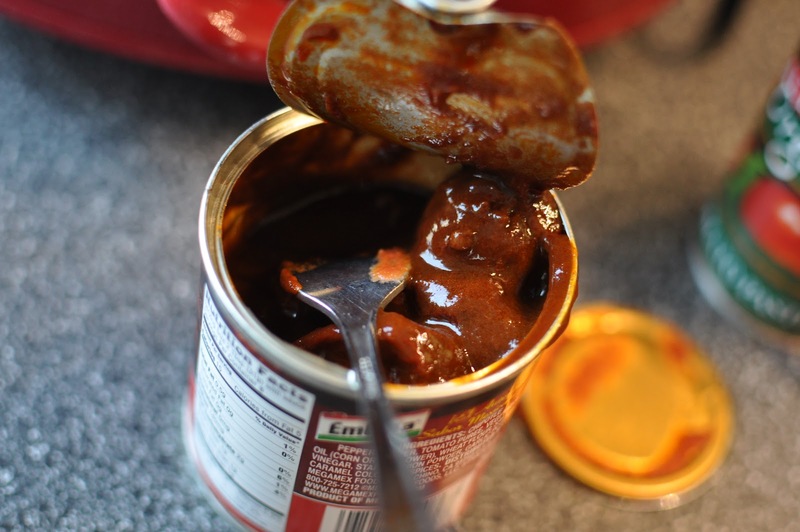 I also added some of the adobo sauce drippings from the can, for extra measure. We like our food spicy in the Mommy Medley household! Add a light shredding of cheddar cheese on top. Bake 15 to 20 minutes at 425 degrees, uncovered. 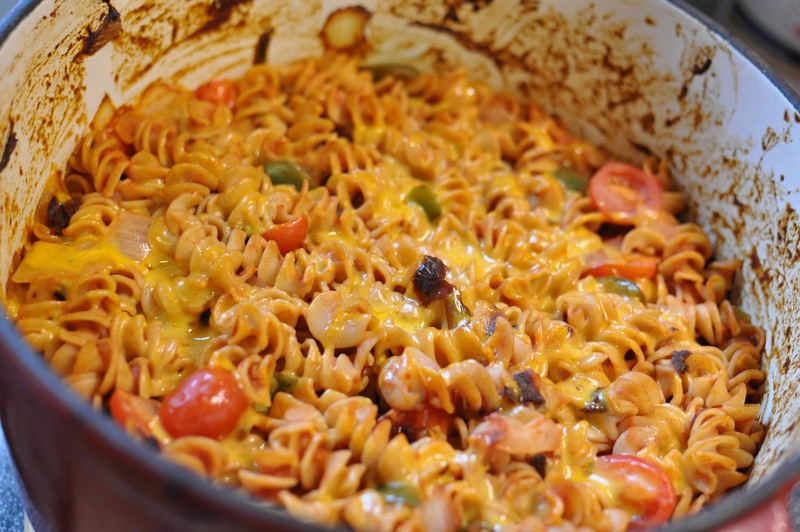 This pasta dish is a wonderful mix of cheesy, tomato goodness and the smoky chipotle goodness. This one’s a keeper around here. 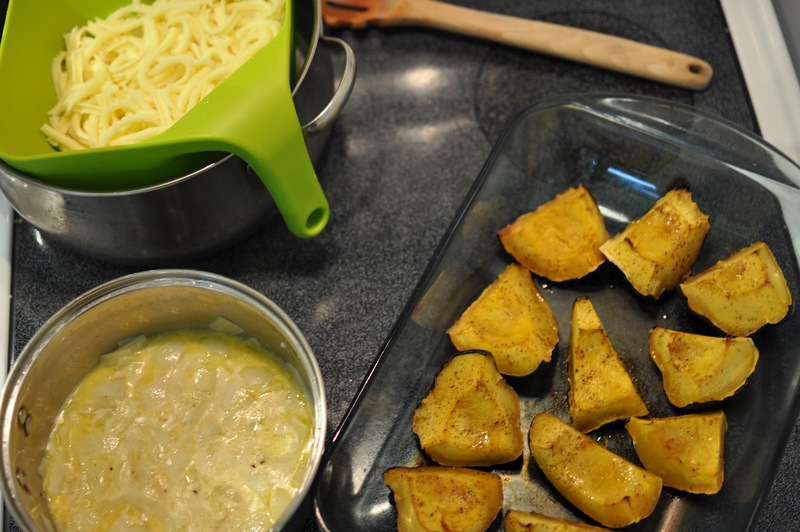 If you time things right, your squash and pasta will be done simultaneously. Sadly, I think this squash was picked a little early. It was soft and fleshy like an acorn squash should be, but it lacked the proper flavor. Oh well, we have two to three more growing now, hopefully the next ones will taste better. 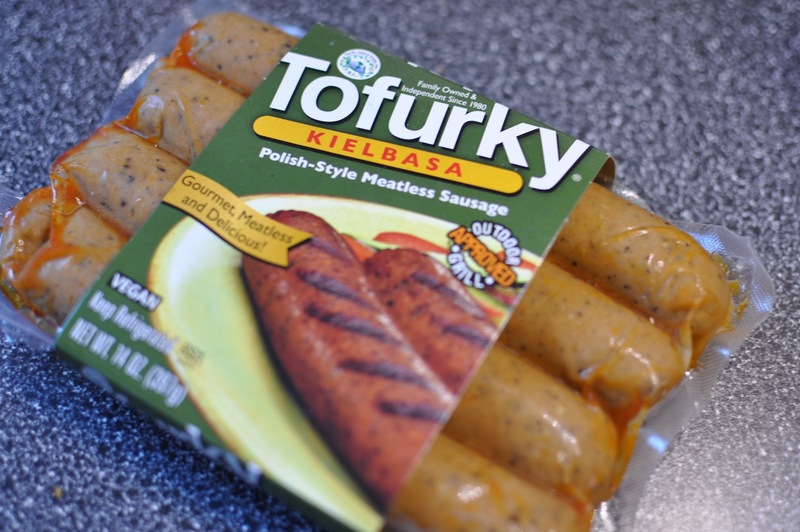 Are any of you starting to see the food trends in my household? 1. 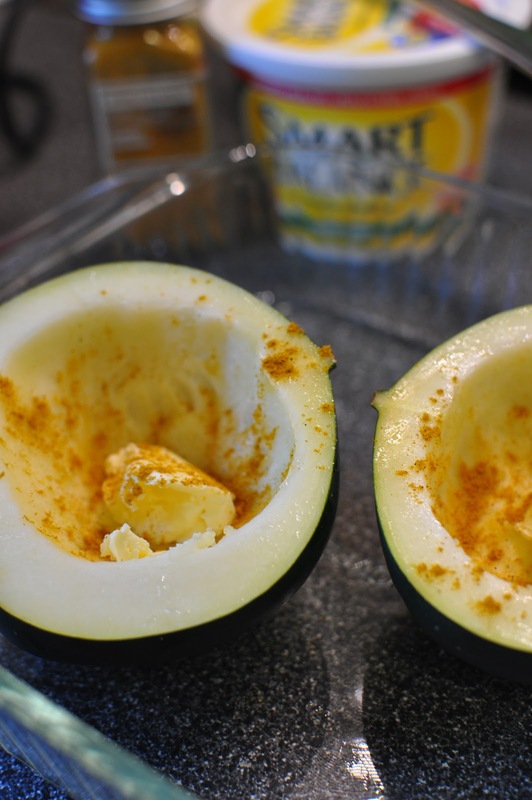 Cut 1 acorn squash in half, scoop out the innards, and place in a square glass baking dish. 2. Fill the inside of the of squash with spices, such as curry or pepper and 1 tablespoon of butter or margarine per squash half. Add about an inch of water to the bottom of the pan. 3. Bake in a 425 oven for 35 to 40 minutes or til soft. Test with a fork. 1. 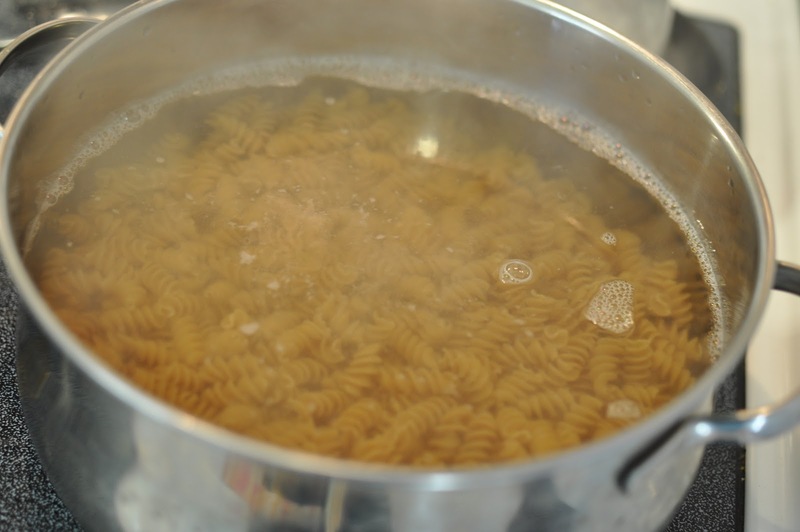 Boil 16 oz box of pasta. Cook according to the directions on the package. 2. Meanwhile, in a medium sauce pan, saute 1/2 of a diced yellow onion, and 1 diced green bell pepper in 1-2 tablespoons olive oil for 5 minutes or til soft. 3. 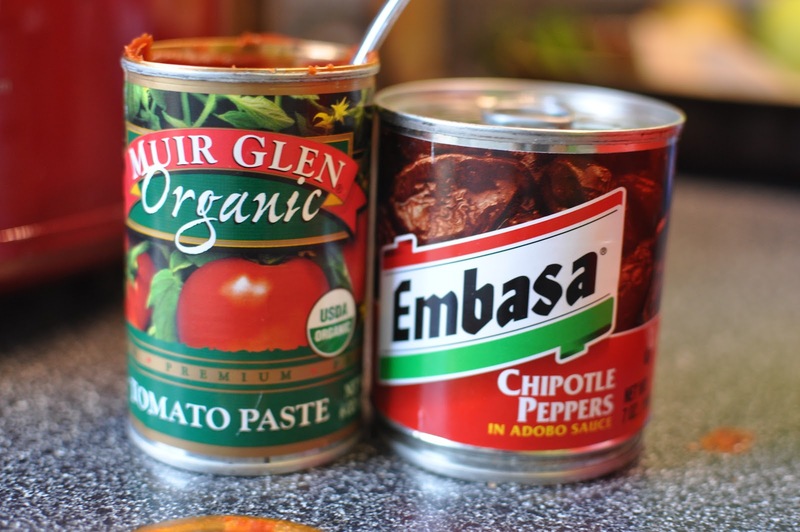 For the sauce, mix 12 oz of tomato sauce, 1 cup of milk, 3 oz of tomato paste (about 1/2 the can), 2 cloves of minced garlic, and fresh ground pepper, to taste. 4. 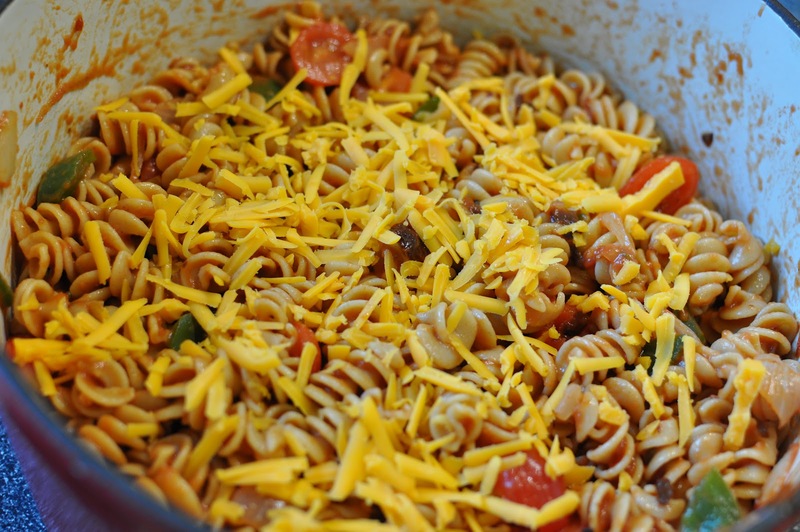 Drain the cooked pasta and place in a large oven safe baking dish. Add the sauce mixture and 1/2 pint of sliced grape tomatoes, mix well. 5. Thinly slice 3 chipotle peppers and add to pasta mixture. 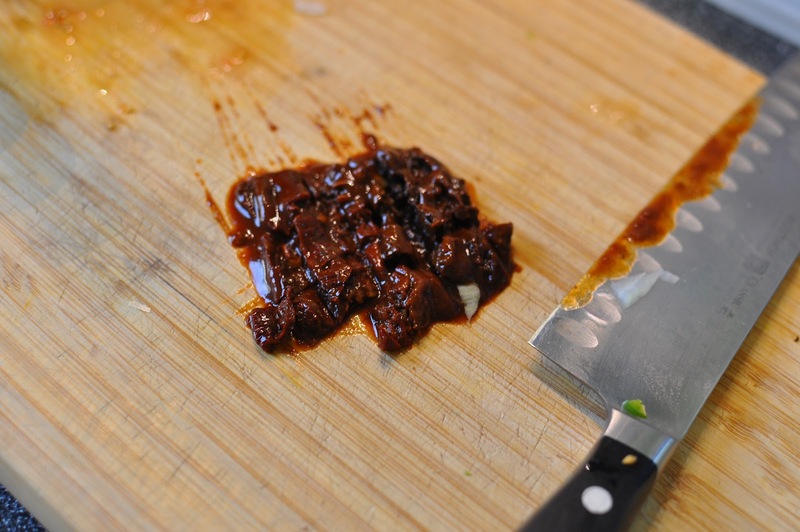 Add some of the adobo sauce drippings from the can, for extra spicy measure. Sprinkle a light shredding of cheddar cheese on top. 6. Bake 15 to 20 minutes at 425 degrees, uncovered. We have been loving the slow cooker at our house lately – it may run out of power at the rate we are using it. 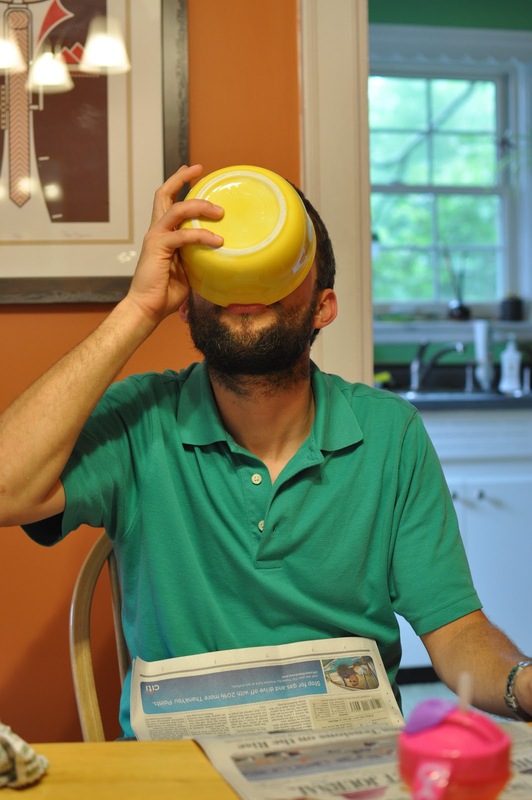 This next soup recipe is so good it will have you slurping it down like this. Eric told me several times that this was a good soup, which for a man of few rants and raves, this is big! 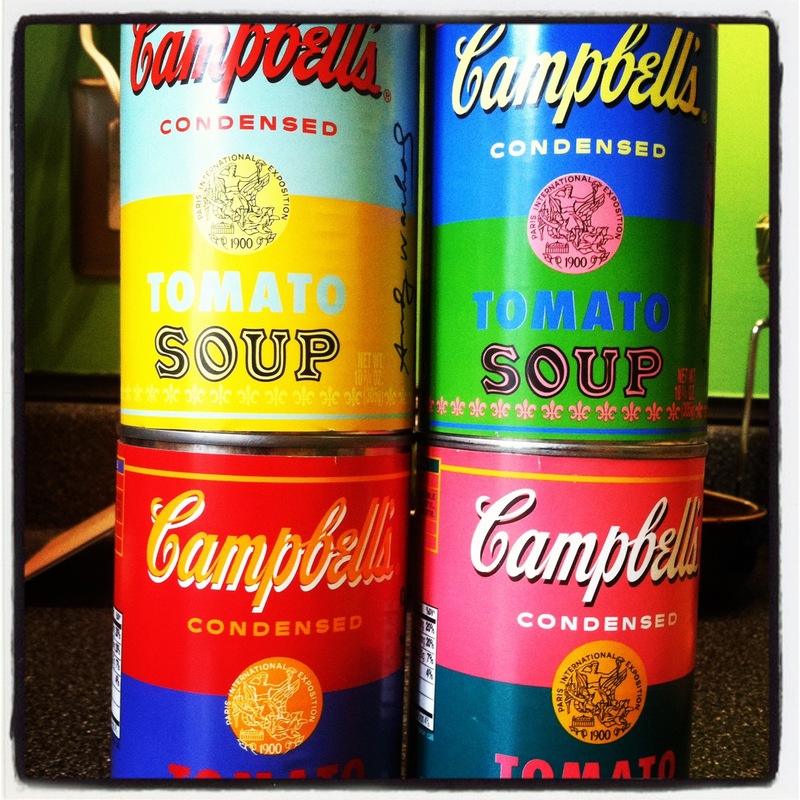 Speaking of loving the soup, have you seen the Andy Warhol limited edition soups at Target?! Of course I bought all 4. Ok, so back to my soup recipe. 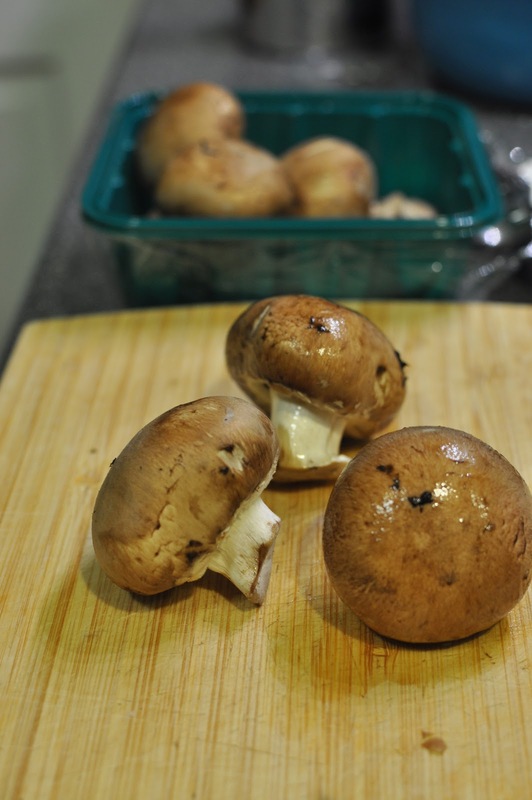 I started by dicing mushrooms, both shiitake and brown bellas. 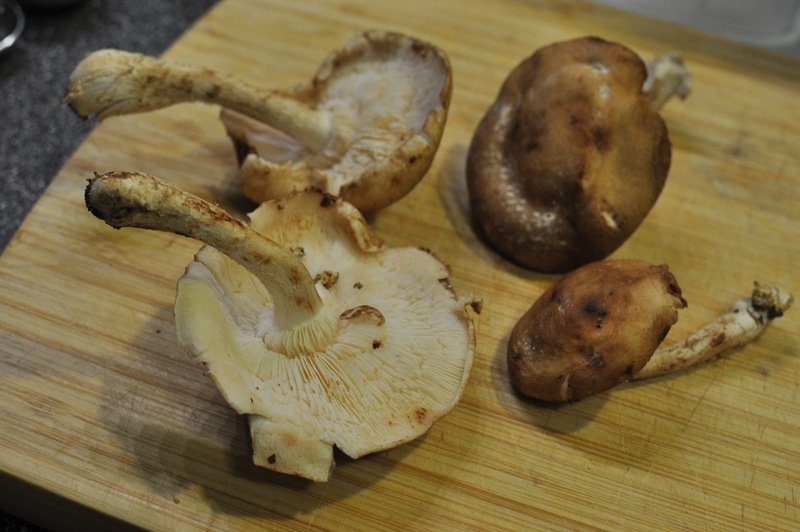 I love the shiitake mushroom – it’s delicate lacy underside, it’s flavor, and around here, it’s delicacy due to prices. This is the normal mushroom in our dishes. Next, peel and cube a butternut squash. I cannot get enough butternut squash. 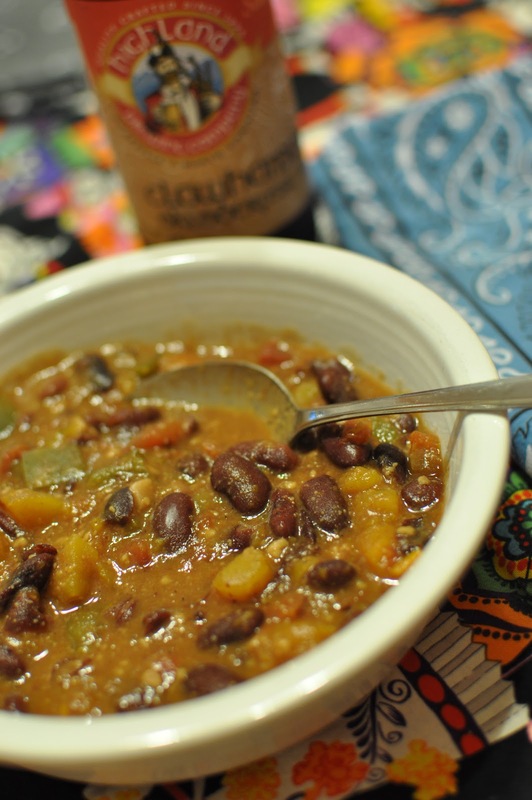 It’s flavor lends itself so well to soups. 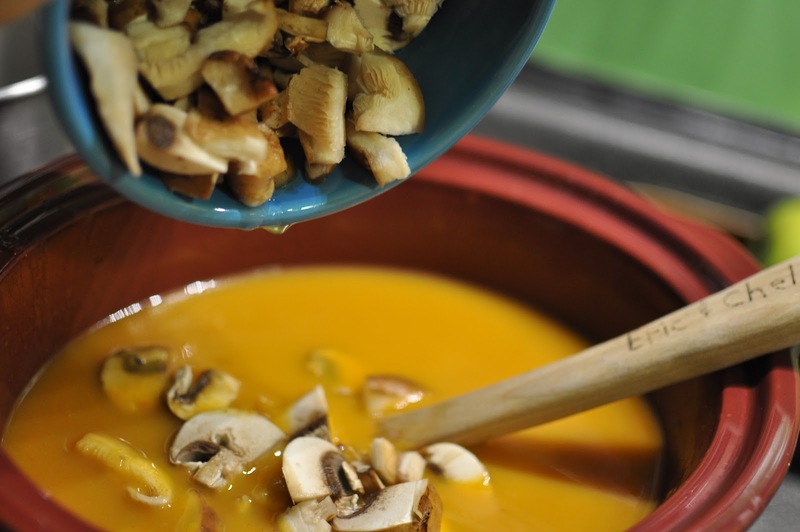 Boil the butternut squash on the stovetop in 15 oz of broth for 30 minutes or until soft. 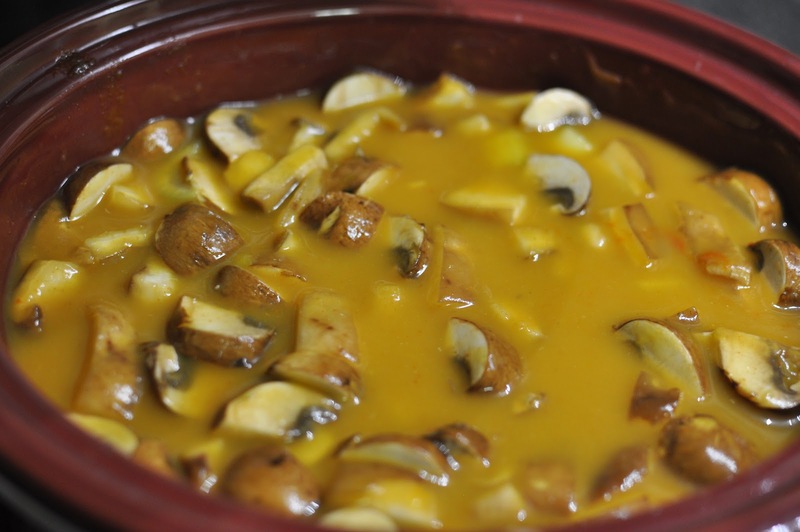 Or, place the broth and squash in a 4 to 5 quart slow cooker and cook 8 to 10 hours on low or 4 to 5 hours on high. 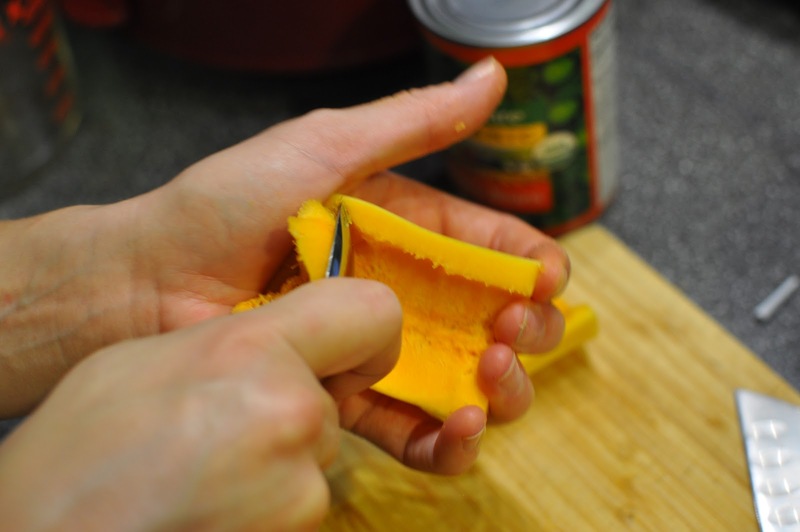 When the squash is cooked, blend until smooth. 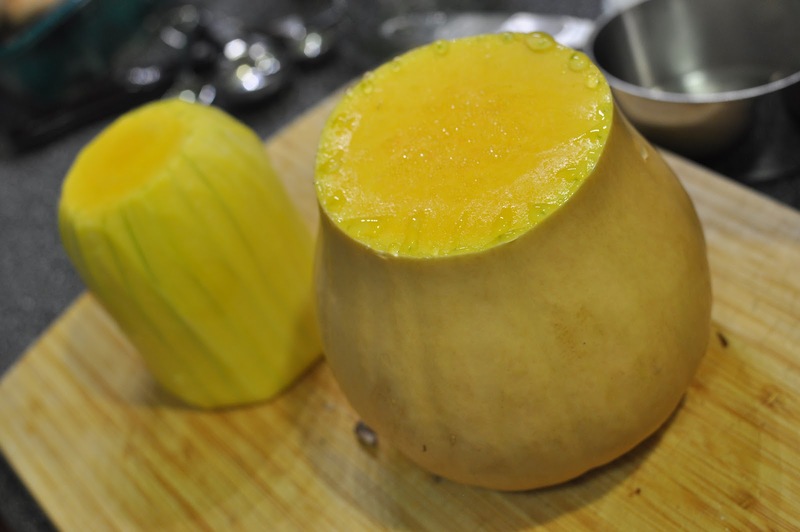 Allow the squash to cool before blending, if you do not have an immersion blender, otherwise you are likely to burn yourself on hot soup spraying out through the lid. 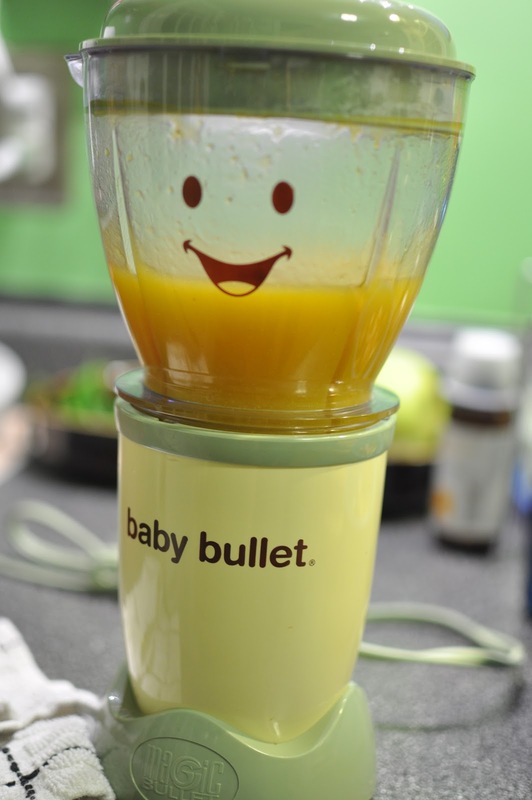 I admit though, the Baby Bullet did a fine job preventing burns. 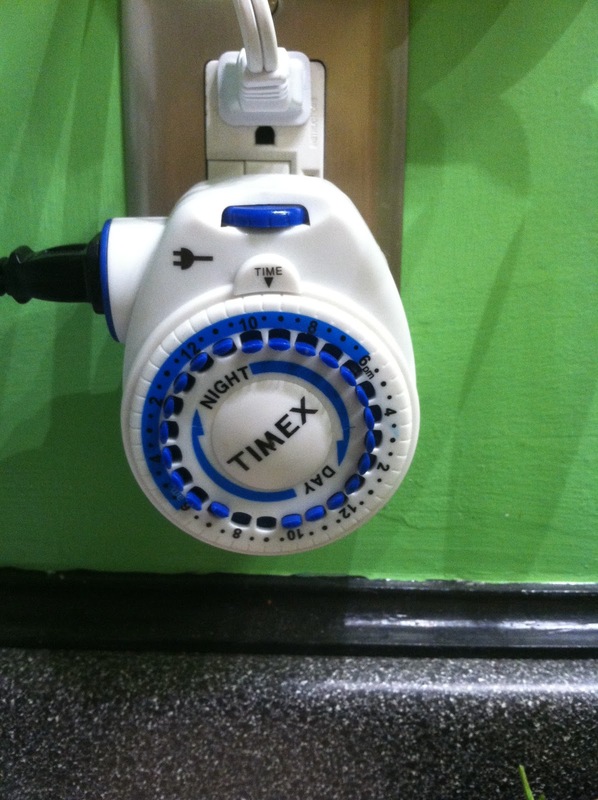 Another reason to have one of these gadgets around the house. 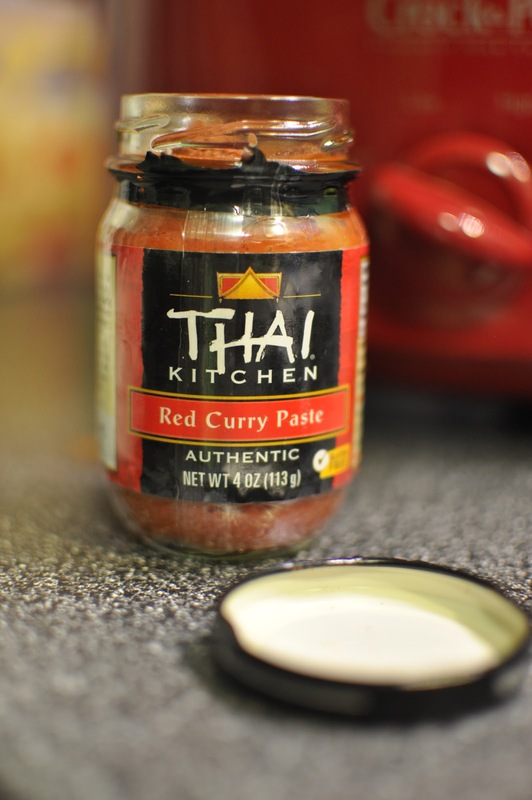 Add 2 to 3 tablespoons red curry paste and and 1 cup milk, stir until combined. 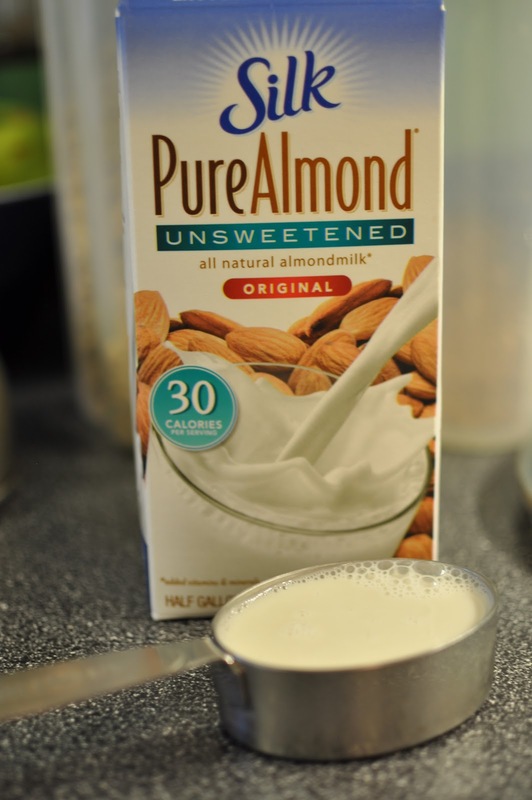 I use almond milk in place of milk in all my recipes. Mix in the diced mushrooms. 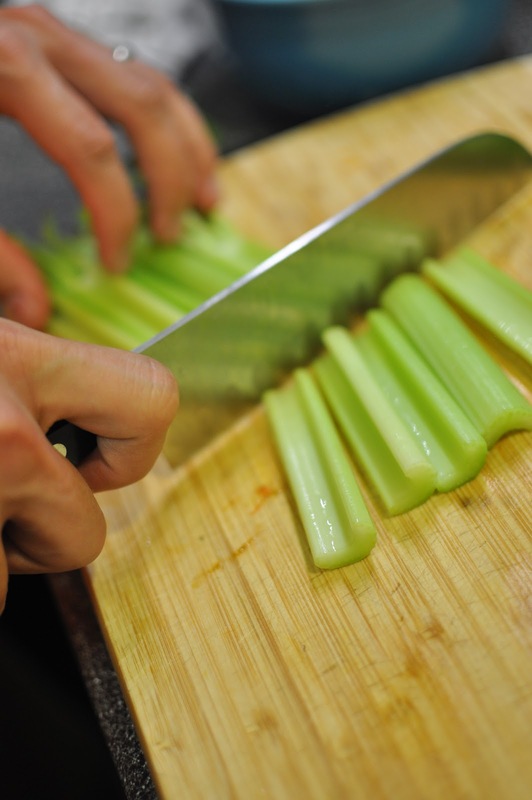 Add 2 cups diced celery. 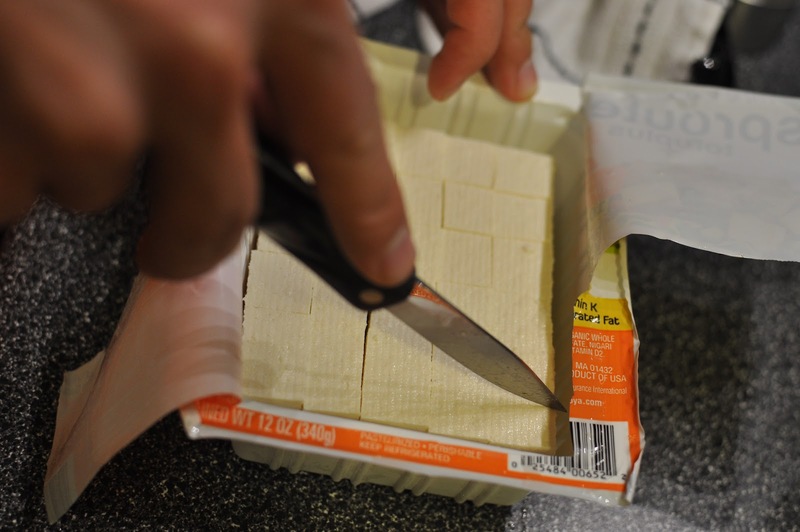 Slice one package of extra firm tofu. 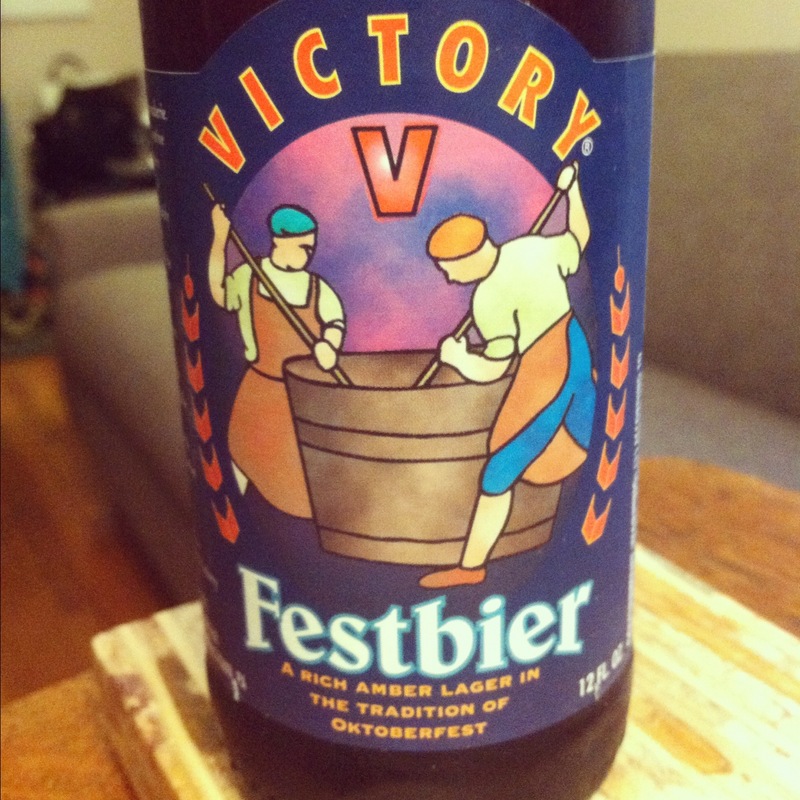 I tried this new variety for this recipe – it did not disappoint. The tofu held firm through the entire duration of the soup’s cooking time. Cook in slow cooker on low for 5 to 6 hours. 1. Cut and peel 4 pounds of butternut squash. Combine with 15 oz of vegetable broth. Boil on stovetop for 30 minutes, or til softened. Or, cook in slow cooker for 8 to 10 hours on low or 4 to 5 hours on high. 2. 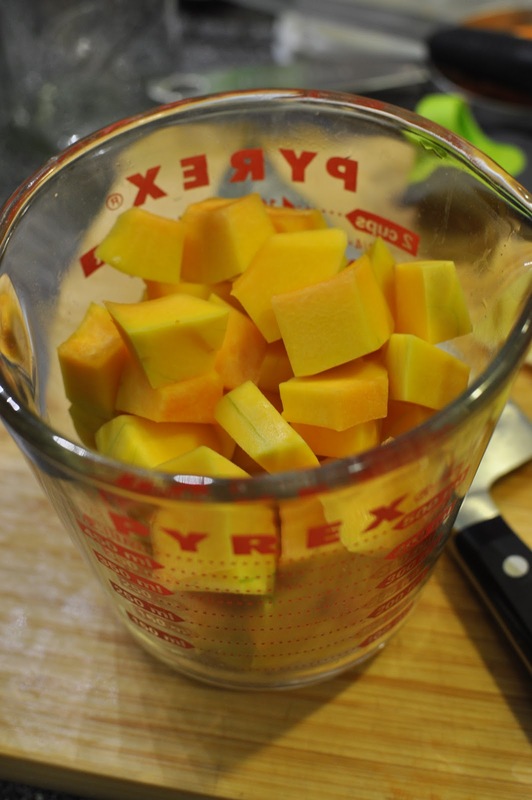 Blend cooked squash in batches until smooth. 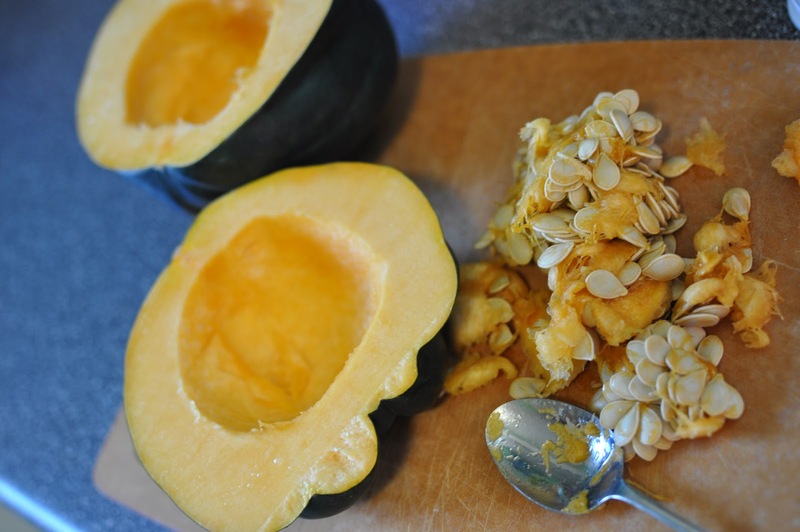 Place pureed squash into slow cooker. Stir in 1 cup of almond milk and 2 to 3 tablespoons of red curry paste. 3. Mix in 2 cups diced assorted mushrooms and 2 cups diced celery. 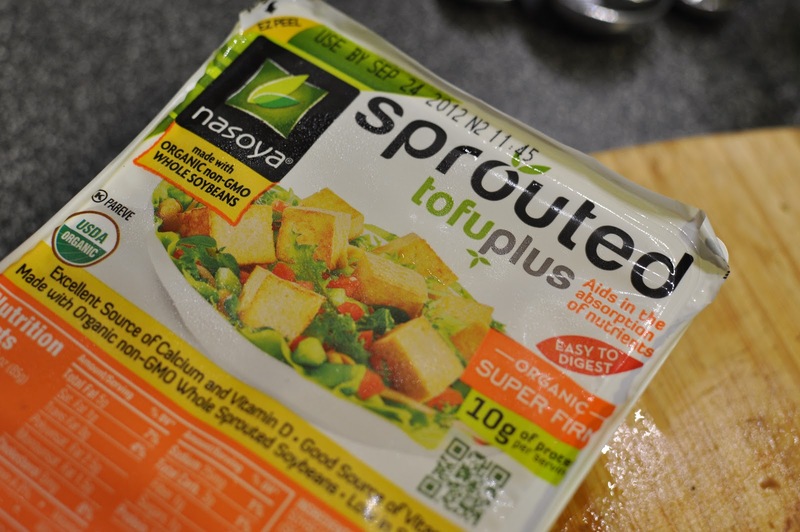 Drain and slice into strips, one package of extra firm tofu, add to the slow cooker. Soup will thicken after storage, so you may want to add a little extra water or milk when eating leftovers, if there are any, that is. Slow cooked oatmeal is one of my new favorite things. This time I made Apple Pie Oatmeal. I swear this is the best oatmeal I’ve ever tasted. It reheats perfectly! So when you make a big batch, store some away in the fridge or freezer for a simple, quick week day breakfast. The magic flavors for this fabulous oatmeal. Who needs a fancy slow cooker with a built-in timer when you have one of these bad boys? 1. 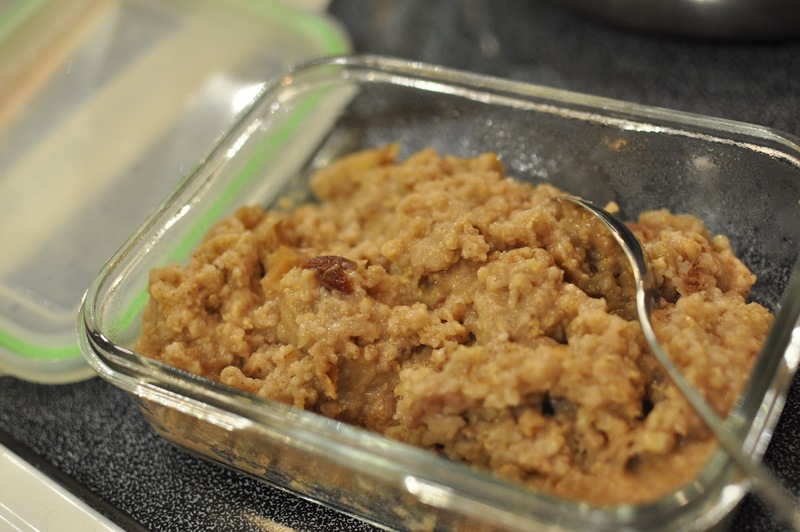 In a 4 to 5 quart slow cooker, mix 1/3 cup millet, 1/3 cup plus 2 tablespoons steel cut oats, and 2-1/4 cups water. 2. 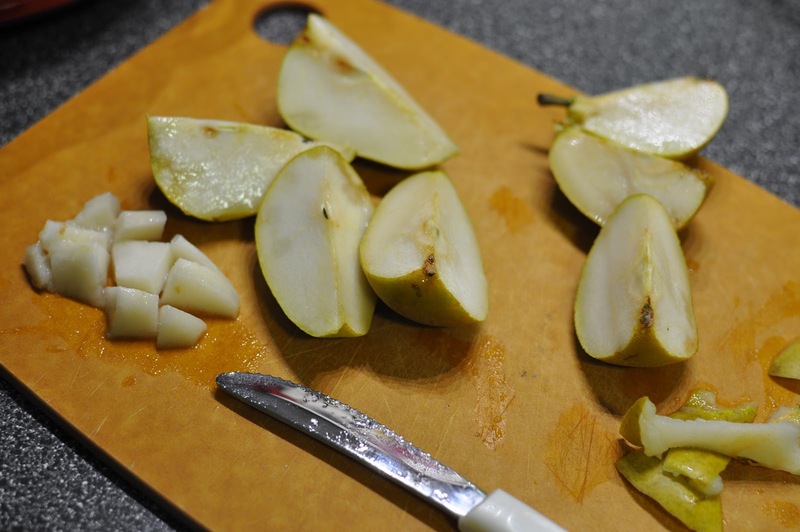 Add to the slow cooker, 1 cubed Granny Smith apple. Peel, if desired. 3. Add 1/2 teaspoon ground cinnamon, 1/4 teaspoon ground nutmeg, 1/4 teaspoon ground cloves, 1 tablespoon honey, and 1/3 cup dried cranberries. Mix well. 4. Cook on low for 6 to 7 hours. Serves 4. The timing of my finger splint coming off lined up perfectly with the start of school. Due to the possibility of damage to the soft tissue, I had to wear the splint all day and all night for 7 weeks. I was able to start weaning off of it just before heading off on our vacation out West. Long story short, artwork was severely stunted this past summer. I was able to do sewing projects because I could keep my finger straight while feeding fabric through the machine. The only snag, no pun intended, was when I was hand sewing something and the Velcro on the brace would catch the thread or fabric. Due to my extended hiatus from art, I am currently playing catch-up. First up – the belated wedding gift for my friend Hannah and her husband, Joel. They were married in June and we missed the wedding due to the coinciding date with the last days of school. 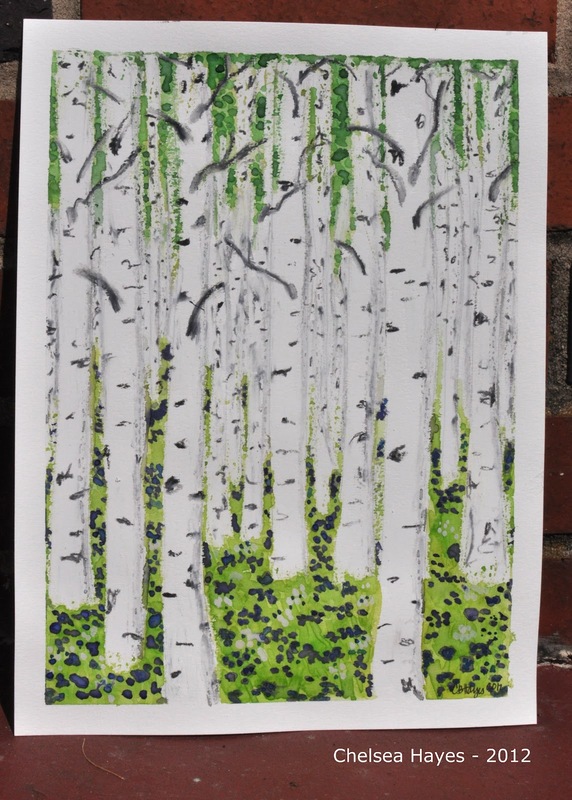 She has a love of Colorado and its stunning birch forests. So, here is her own window to a birch forest. It’s on its way to you soon, Hannah! Check back for more catch-up art projects over the next couple of days. Window to a Birch Forest, oil pastel and watercolor on paper, 9 x 12″, 2012. This is an easy breakfast that is sure to get you out the door a little more quickly in the mornings. Just prep the night before, set on low, and you have hot filling breakfast in the morning. The smell alone will get you out of bed! 1. 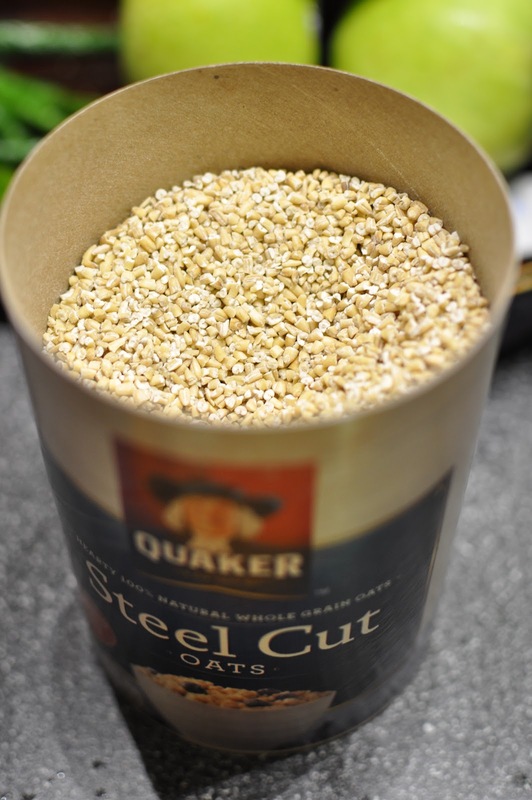 Start with 2/3 steel cut oats and 1/3 cup millet, put them in a 4 to 5 quart slow cooker. 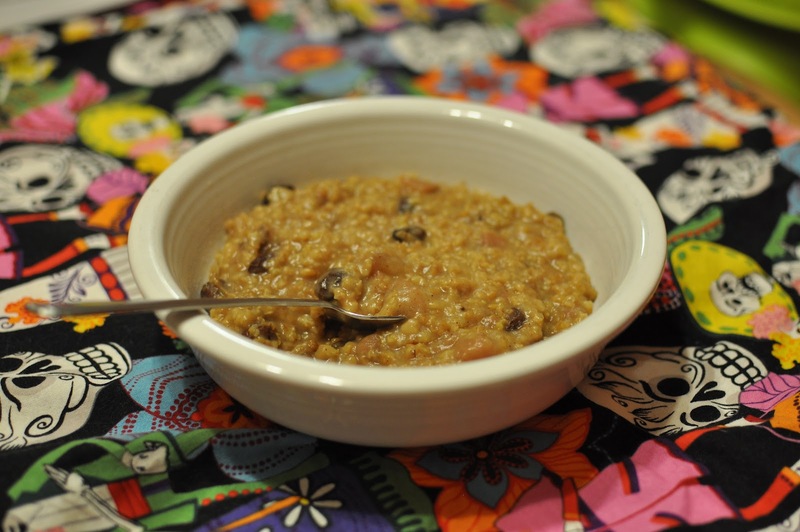 Steel cut oats are a wonderful breakfast food – they have a great chewy texture and are heartier than the rolled oats which are just oats steamrolled flat. Millet is a seed, and available in white, gray, yellow, and red. This seed is a good source of manganese, phosphorus, and magnesium. 2. Add 1-1/2 cups water and 1-1/2 cups almond milk. Stir. 3. Peel and dice 2 small ripe pears. 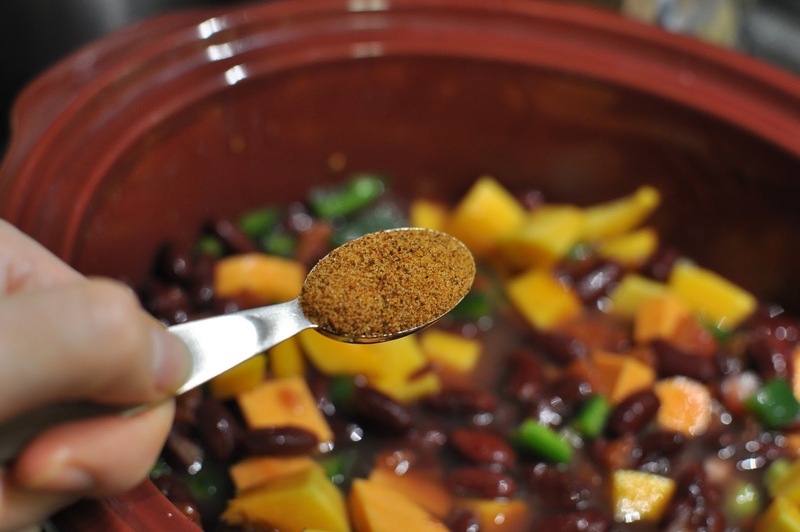 Combine in slow cooker with 1 teaspoon cinnamon, 1 teaspoon vanilla, 1/3 cup raisins, and 1 teaspoon honey. 4. Cook on low for 6 to 7 hours. Enjoy warm! Caution, if this is cooked too long or on high, the bottom portion of your oatmeal will scald to the bottom of the pot. If this does happen, don’t toss your oatmeal, just skim off the top sections without breaking through to the bottom. 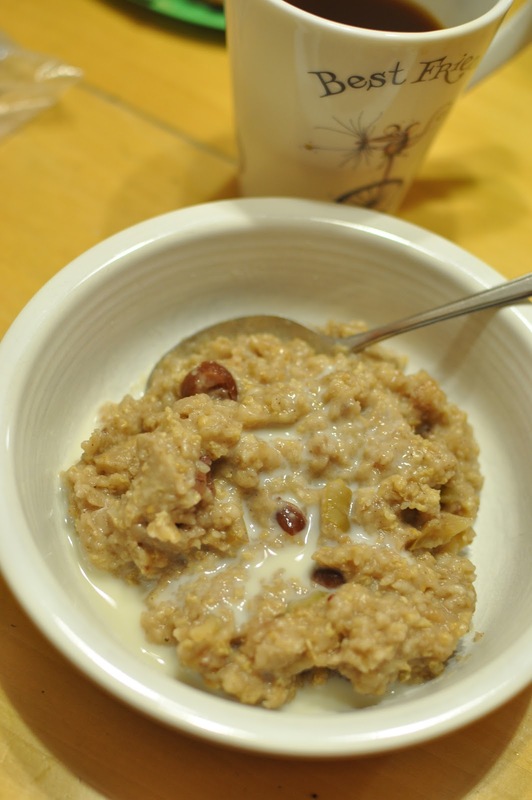 Breaking through to the scalded section will leave you with a burning taste in your oatmeal. Fall is most certainly upon us. 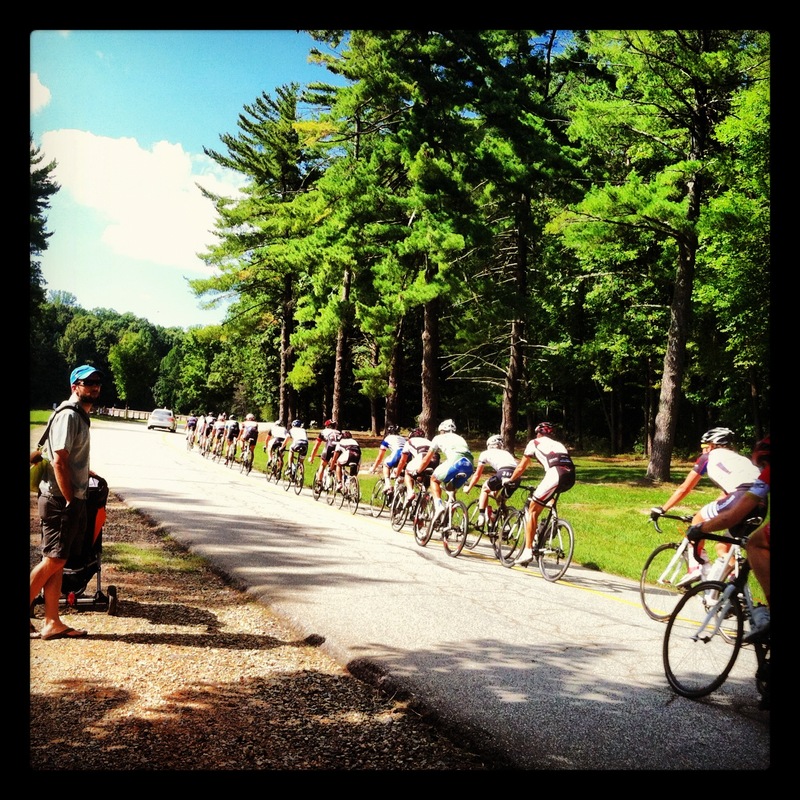 This past weekend we were at the Science Center and the Carolina Cup for its 40th annual bicycle race. The weather has been beautiful – high 70s during the day and into the mid to low 50s at night. I could not ask for more beautiful days. These days are advertisements for why this region of the south is so lovely. The long autumn stretches into a brief winter, and a long spring. 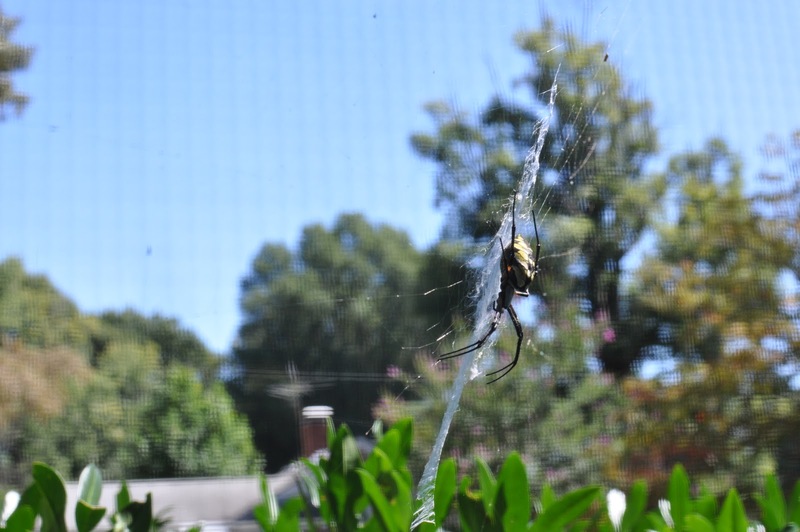 The return of the black and yellow argiope (Argiope aurantia) is another tell-tale sign of autumn. These beauties show up every fall in bushes, hostas, and sides of houses. The ones this size are female and will grow up to an inch and half long. 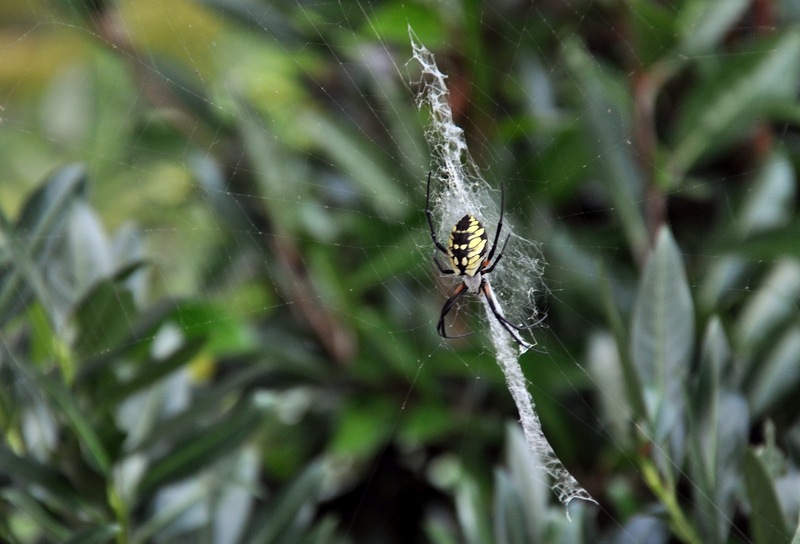 These spiders are harmless to humans, in fact they eat many insects and actually are quite helpful in ridding gardens of pests. Our friend has also laid a large egg sac. This egg sac contains 1,000s of eggs that have already hatched. However, the young spiders will remain inside this egg sac until spring. Our spider friend will eventually die, since she has laid her eggs. Until then, we will enjoy seeing her sitting head down, waiting for insects. Check out more information and photos here. I made the first quiche in a while, this past week. 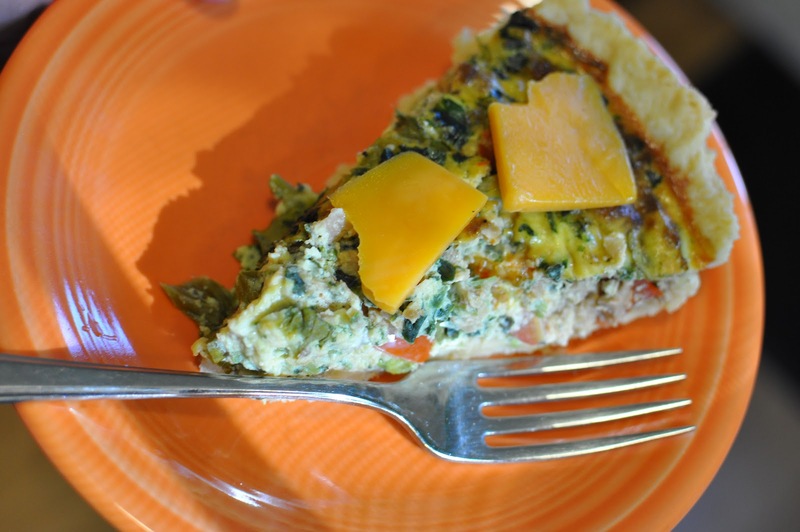 Quiche is a fantastic meal – it can be breakfast, lunch, dinner, brunch, or snack. It is simple and easily mixed up with a variety of fillers. 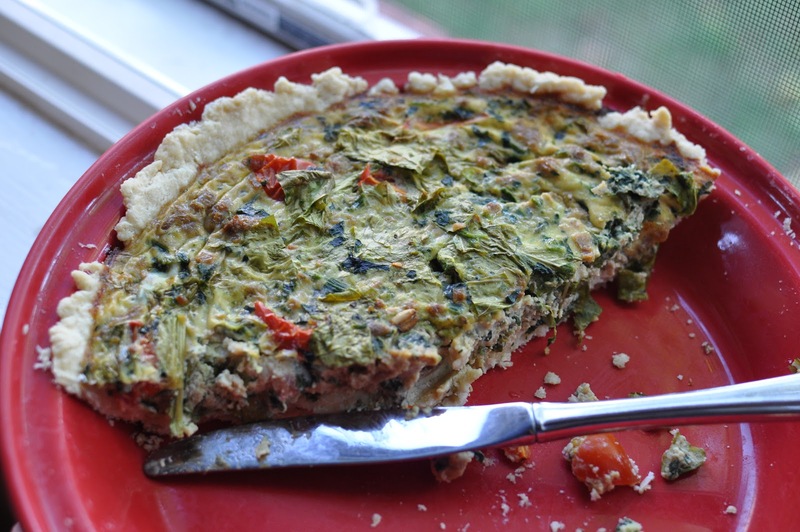 To start a quiche, you need a pastry for a single-crust pie. 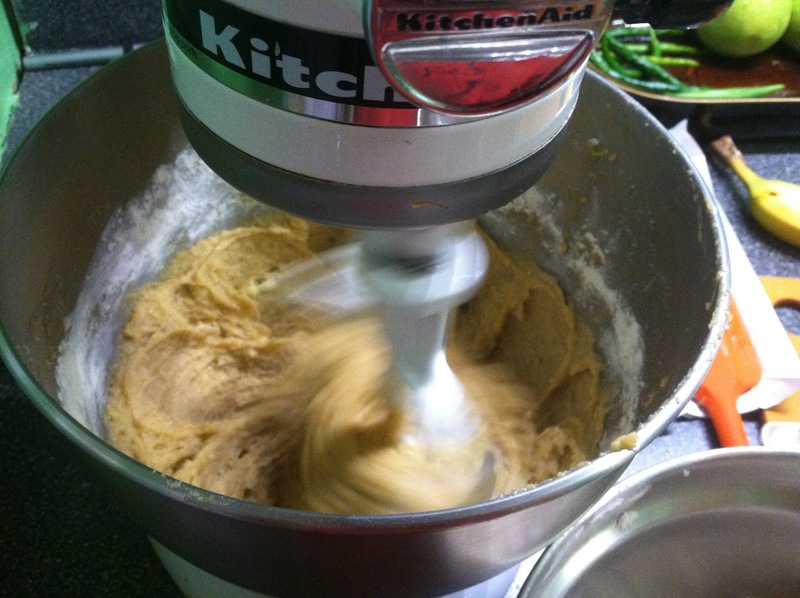 Using a pastry blender, cut in 1/3 cup butter into 1-1/4 cups flour. Pieces should be pea-sized. Sprinkle 1 tablespoon of the ice cold water (or vodka) over part of the flour mixture; toss with a fork. Push moistened flour to one side of the bowl. 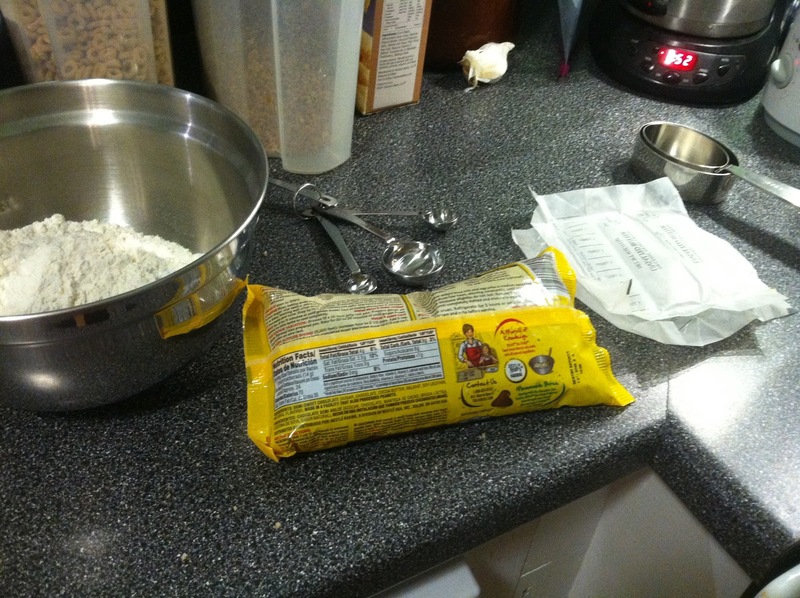 Repeat, using 1 tablespoon of the liquid at a time until all the flour is moistened. Form dough into a ball. On a lightly floured board, use hands to slightly flatten dough. Do not leave it in the sun as it is here in this photo. The dough will become too warm. If the dough does get too warm, place it in the refrigerator until it is cold again. Roll dough from center to edges into a circle about 12 inches in diameter. 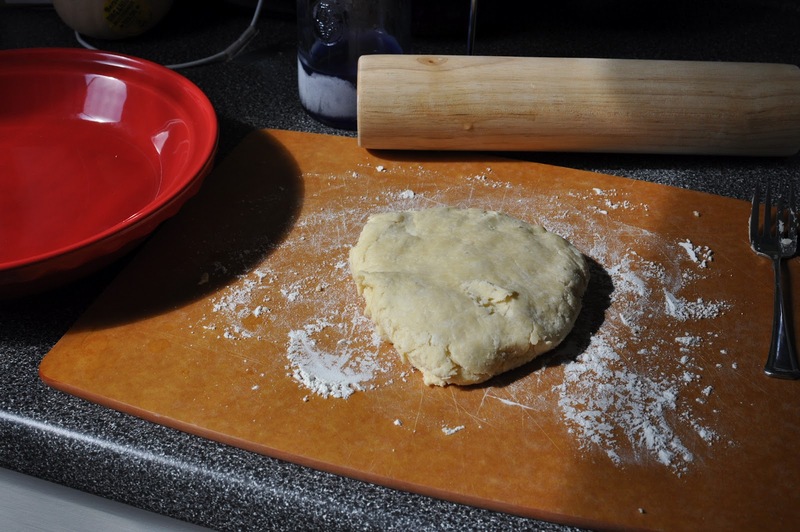 To transfer pastry, wrap dough around a rolling pin. Unroll into a 9-inch pie plate. Do not stretch the dough, as this will cause shrinking. Trim excess dough and fold over. Do not prick dough. Line with double thickness of aluminum foil. Bake in a 450 degree oven for 8 minutes. 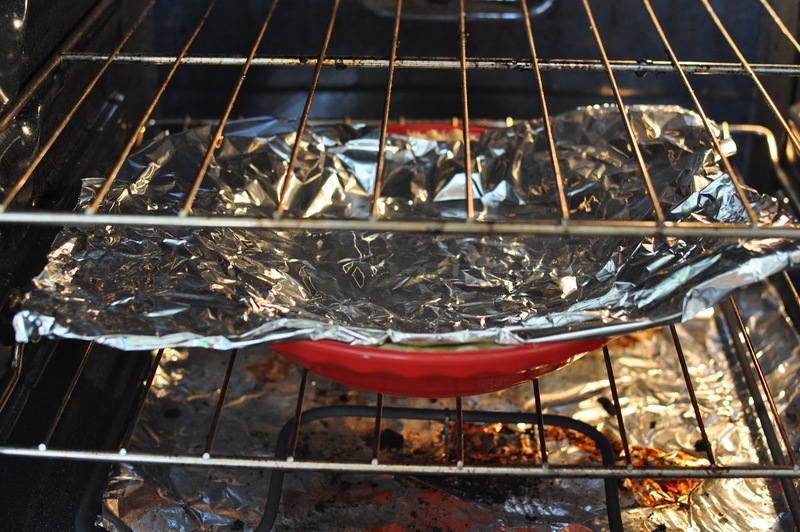 Remove foil, bake in a 325 degree oven for 4 to 5 more minutes or until pastry is set and dry. Set pastry aside and start filling. 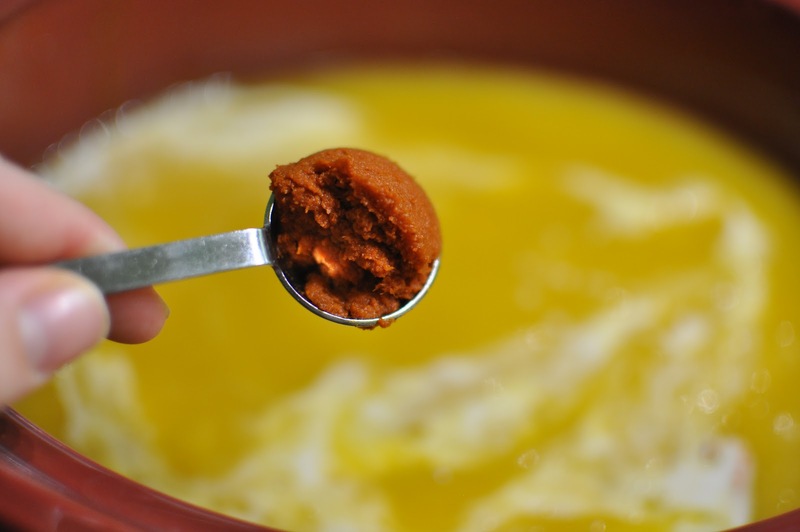 Whisk six eggs in a large bowl. Whisk in 1/2 cup milk and 1/2 cup plain low-fat yogurt. 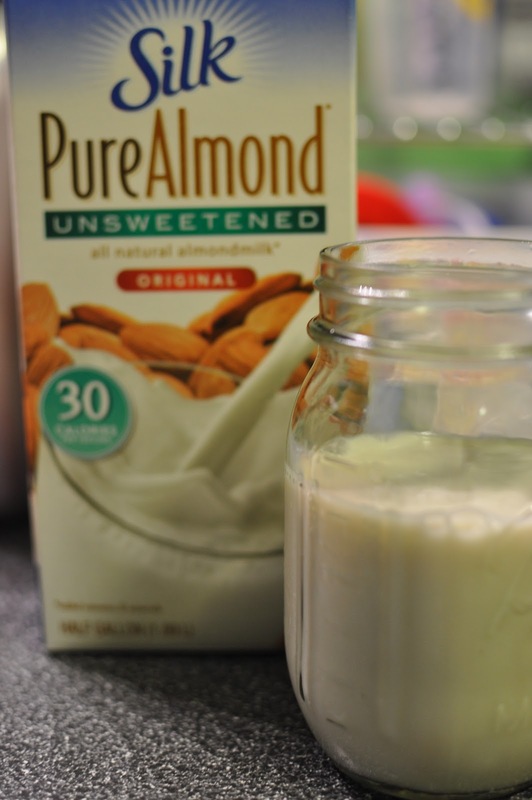 I use almond milk in all my recipes. Mix in 2-3 cups chopped fresh spinach. 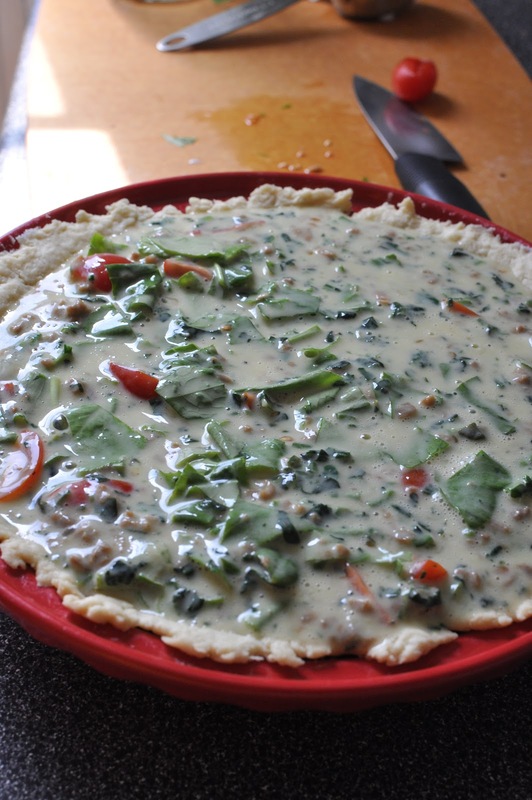 I also used about 1/3 cup frozen spinach, because I was short on fresh spinach. Add 1 cup grape tomatoes, halved. Mix in 1 cup soy beef crumbles. 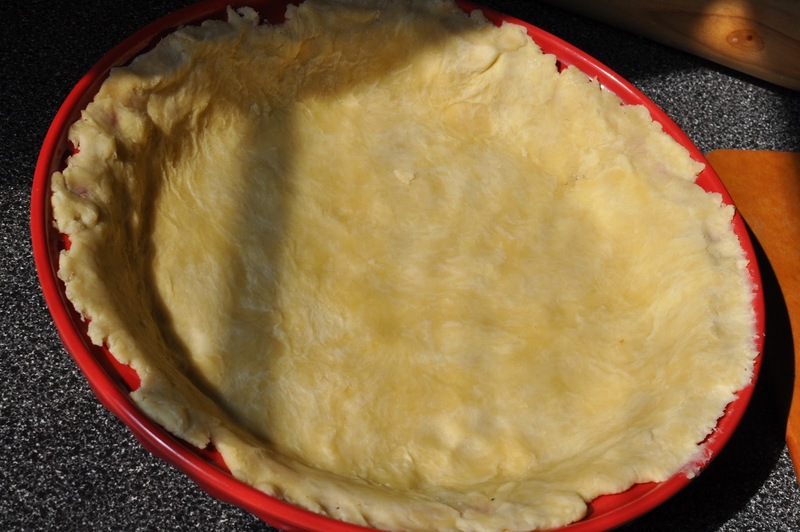 Pour filling into prepared pie crust. Bake in a 350 degree oven for 50 to 60 minutes, or until a knife inserted in the middle comes out clean. If necessary, cover edges with foil to prevent over-browning. This always ends up being a lovely green quiche. 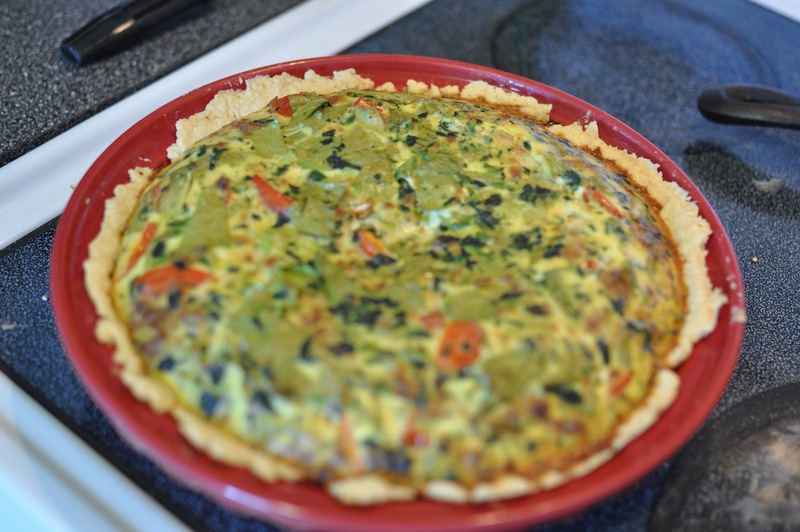 Quiche doesn’t last long enough in our household. 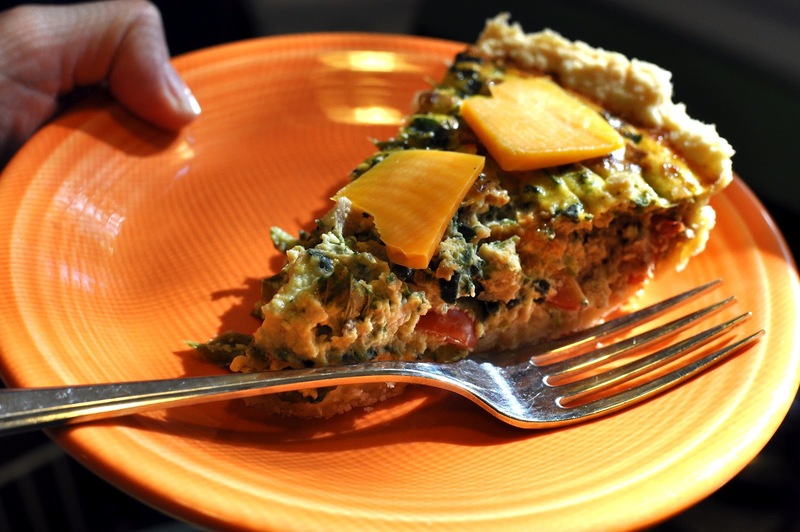 I served this quiche warm with sliced, aged cheddar on top. Cheddar is great cheese due to its natural lack of lactose. 1. 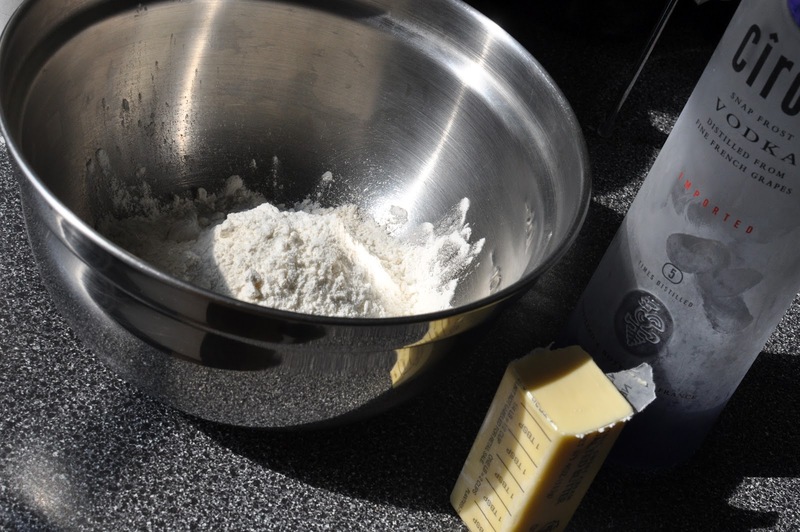 Using a pastry blender, cut in 1/3 cup butter into 1-1/4 cups flour. Pieces should be pea-sized. 4. Line with double thickness of aluminum foil. Bake in a 450 degree oven for 8 minutes. Remove foil, bake in a 325 degree oven for 4 to 5 more minutes or until pastry is set and dry. 1. 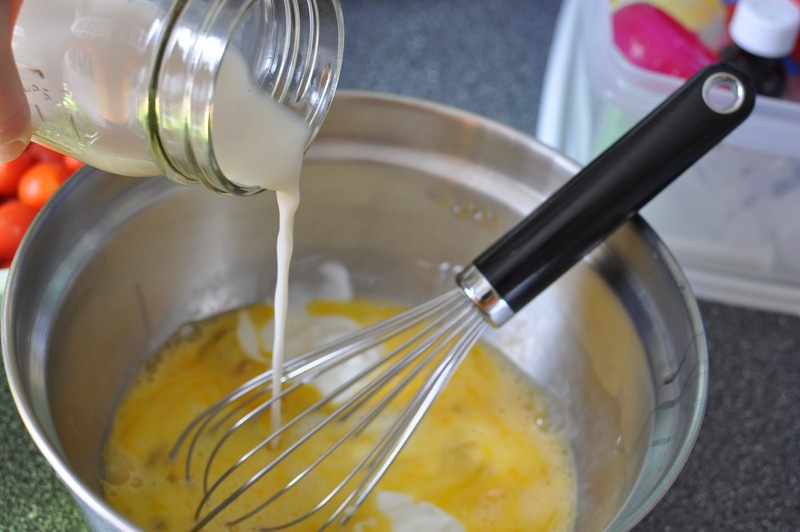 Whisk six eggs in a large bowl. 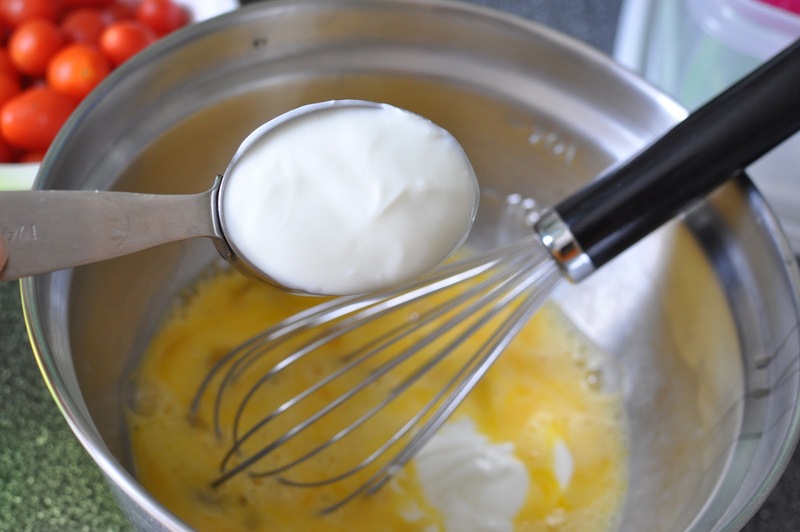 Whisk in 1/2 cup milk and 1/2 cup plain low-fat yogurt with the eggs. Season to taste with freshly ground pepper and salt. 2. 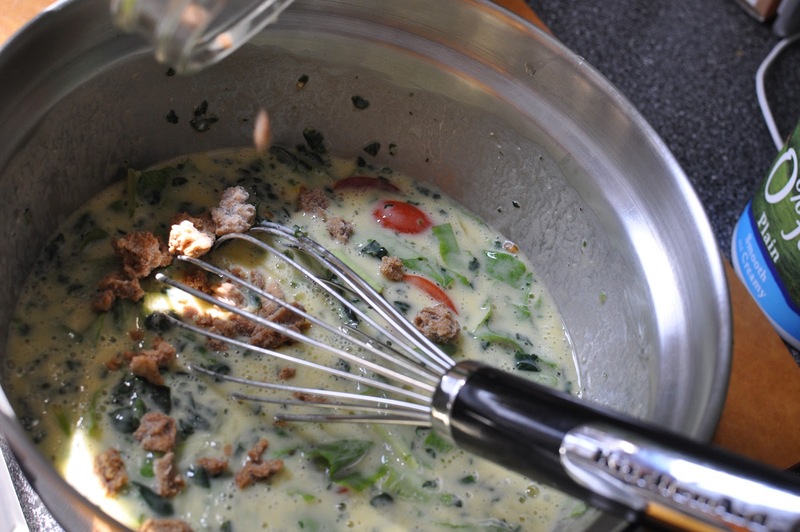 Mix in 2-3 cups chopped fresh spinach. Add 1 cup grape tomatoes, halved. Mix in 1 cup soy beef crumbles. 3. 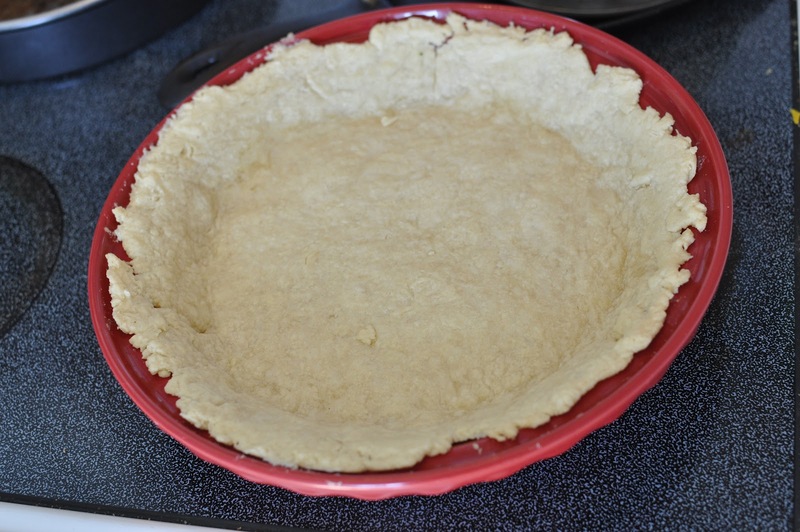 Pour filling into prepared pie crust. Bake in a 350 degree oven for 50 to 60 minutes, or until a knife inserted in the middle comes out clean. 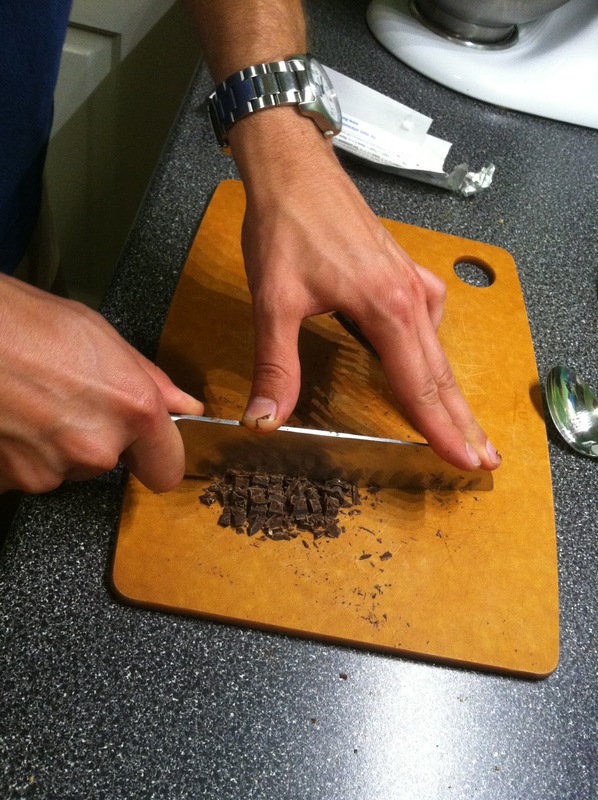 If necessary, cover edges with foil to prevent over-browning. This always ends up being a lovely green quiche. 4. Serve warm with sliced cheddar cheese on top. This stew was everything I want in a meal: quick to prepare, ready when I got home, filling, vegetarian, spicy, and full of contrasting flavors. 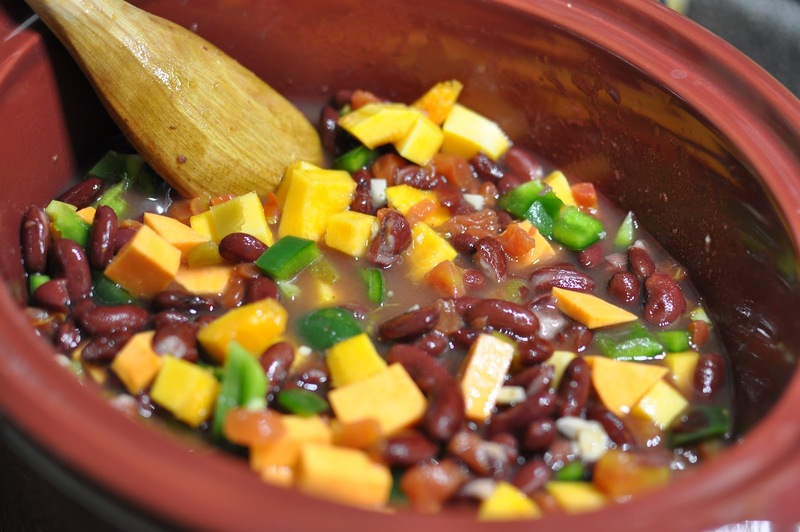 The sweet potato and butternut squash flavors paired perfectly with the kidney beans and peanut butter. Tonight, I have one more recipe adapted from the Skinny Slow Cooker publication by Better Homes, my Squash Sweet Kidney Stew. The title must have something to do with the fact I spent part of my afternoon in Target and Michael’s, where the Halloween decor sucked me in just a little. 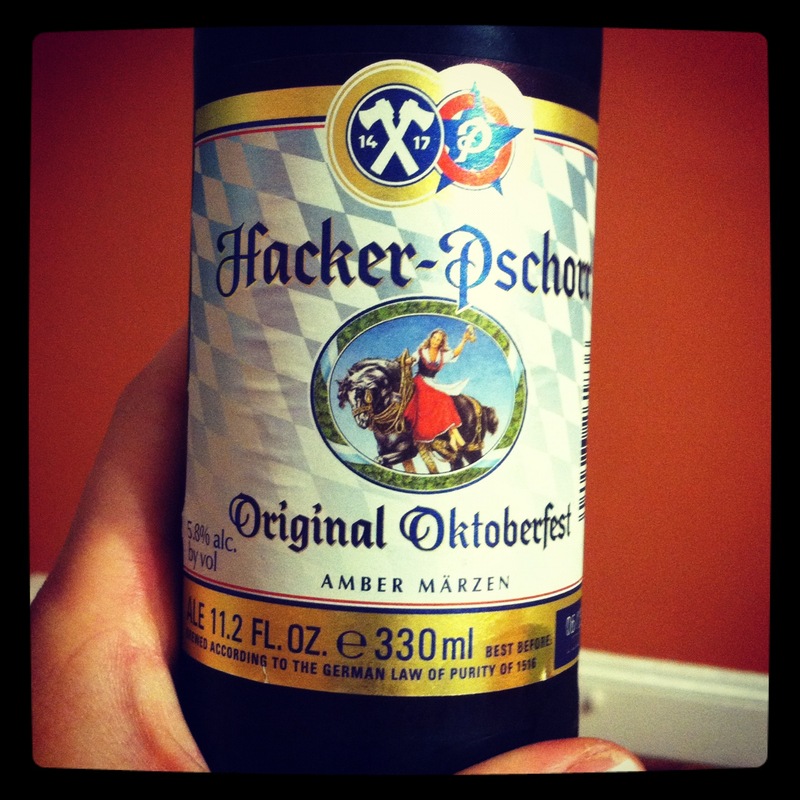 We enjoyed this satisfying stew with Oktoberfest, pretzels, and good friends this evening. I have to say, this is one of the more unusual combinations of flavors in a stew, but I loved it. This is most definitely a keeper in terms of slow cooker recipes. My favorite knife, a Wusthof, a great wedding present from a friend! Peel and cube 1 medium sweet potato. Next, peel 1 medium butternut squash. 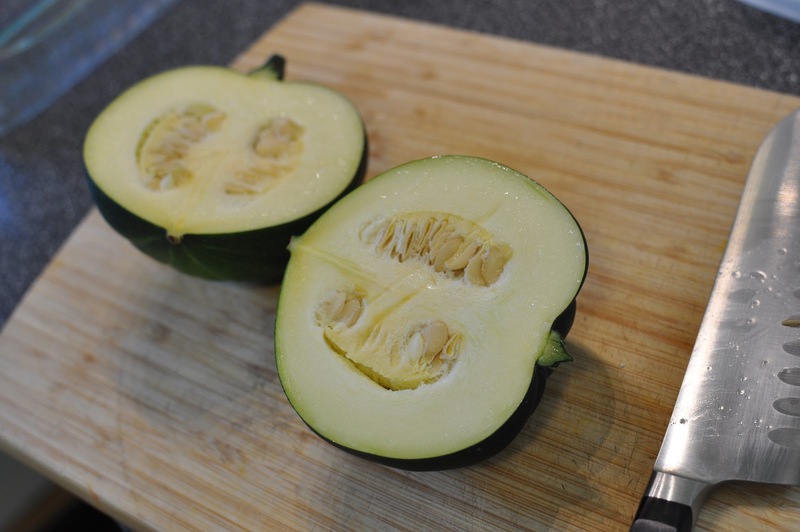 Cut the squash in half lengthwise and carve out the seeds with a spoon. Cube the squash. 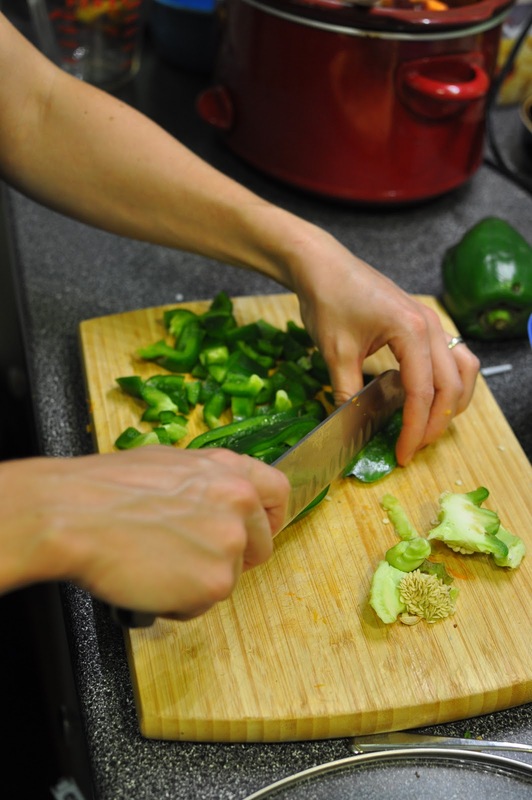 Add the vegetables to a 4 to 5 quart slow cooker. Chop 1 green bell pepper, seeds removed. Add to slow cooker. 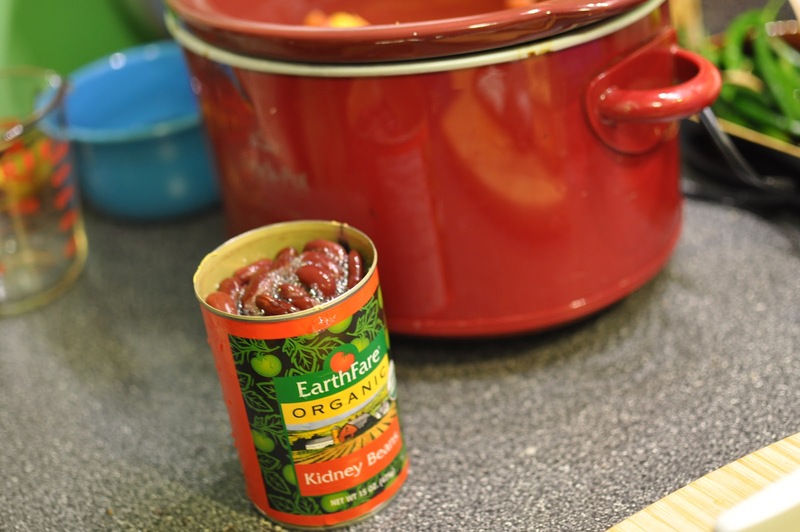 Add 2 cans of red kidney beans to slow cooker. Mince 3 cloves of garlic. 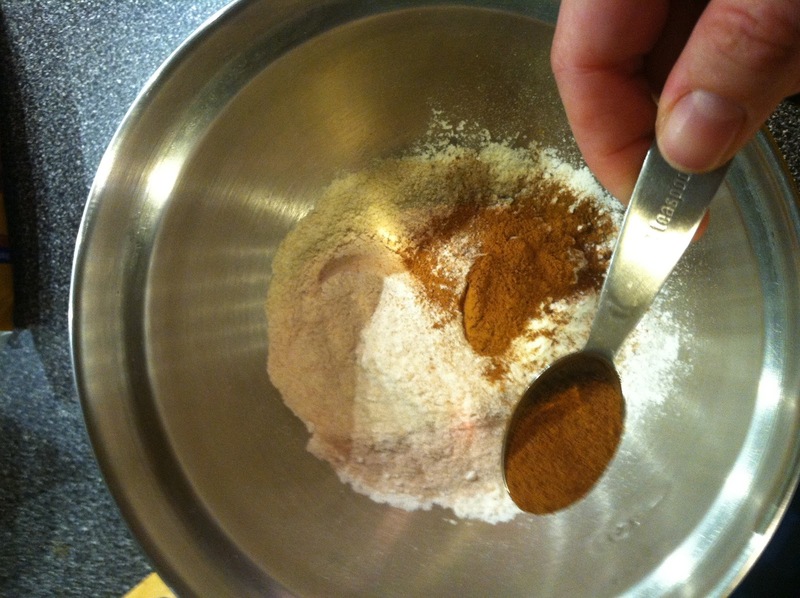 Add 1-1/2 teaspoons Cajun seasoning. Add garlic, seasoning and 14 oz of vegetable broth to the slow cooker. Add 1/4 cup creamy peanut butter. Stir, until ingredients are well combine. Cook on low for 6 to 7 hours or on high for 4 to 5 hours. Serve warm. This stew was spicy with just the right amount of heat, sweet, and salty due to the peanut butter. 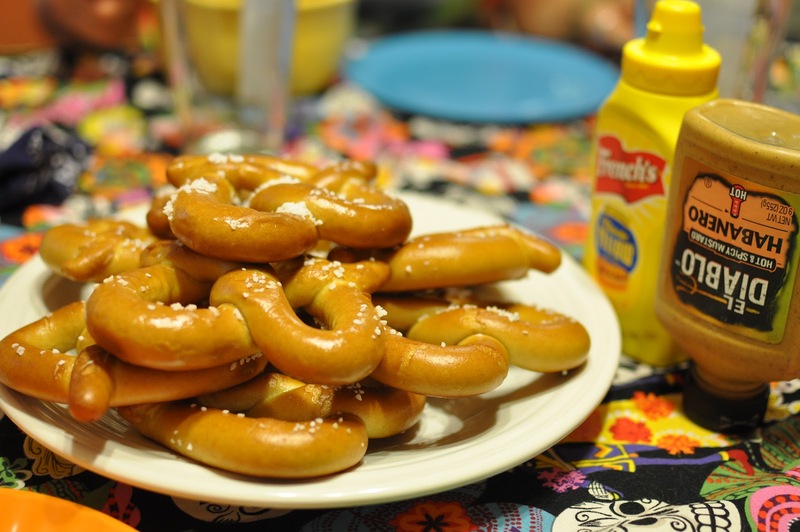 We made a large plate of warm pretzels with mustard to go with our meal. This stew could easily be made a chicken or tofu dish as well. 1. 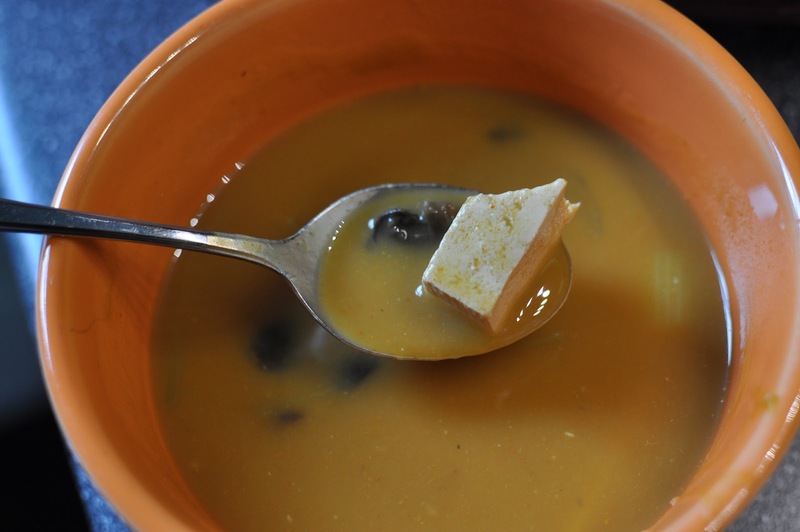 In a 4 to 5-quart slow cooker, combine 1 medium sweet potato, peeled and cubed; 1 medium butternut squash, cubed with seeds removed; and 1 chopped green bell pepper, seeds removed. 2. Add 2 cans of red kidney beans; 3 cloves of garlic, minced; and 1-1/2 teaspoons Cajun seasoning. Pour 10 oz of vegetable broth over vegetable mixture. 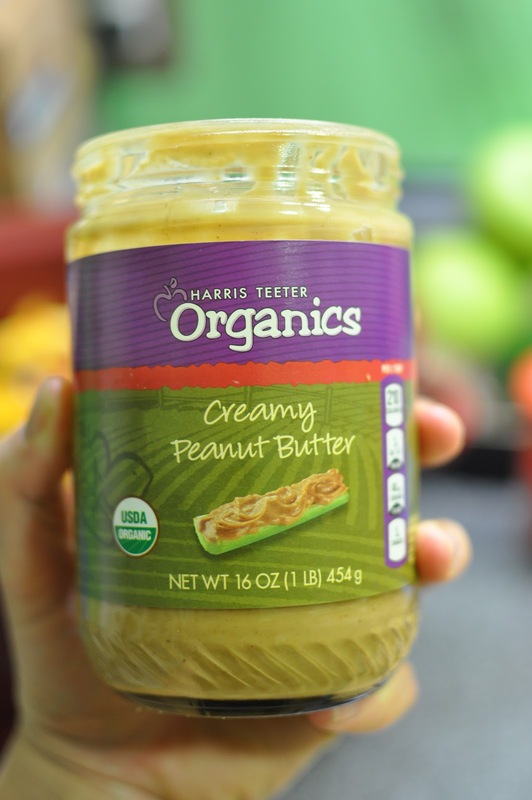 Mix in 1/4 cup creamy peanut butter. Stir until smooth and combined. 3. Cook on low for 6 to 7 hours or on a high for 4 to 5 hours. Sunday morning I was up early and contemplating breakfast and what to do with my Granny Smith apples. I decided to make coffee cake that would kick Eric’s longing for Dunkin Donuts apple fritters (or at least be better for him). As you can see, it got the thumbs up approval. I must apologize – some of these photos aren’t the most appealing due to the cell phone image quality. It was early and I did not want to risk waking a sleeping baby by retrieving the nice camera. Lightly grease a 9-inch round baking pan; set aside. In a small bowl stir together 2/3 cup flour, 1/2 cup whole wheat flour, 1 teaspoon baking soda, 1 teaspoon cinnamon, and 1/4 teaspoon salt. 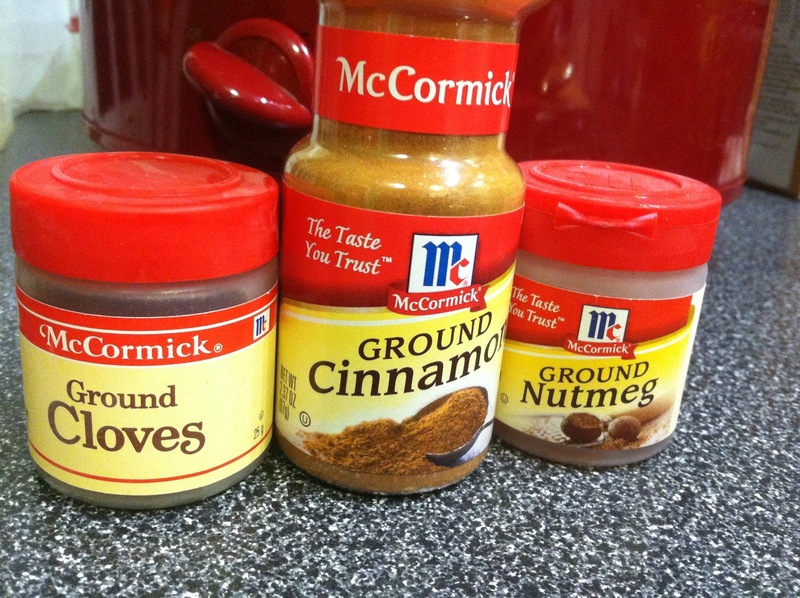 I always use a heaping spoonful, and sometimes double my cinnamon in baking recipes. 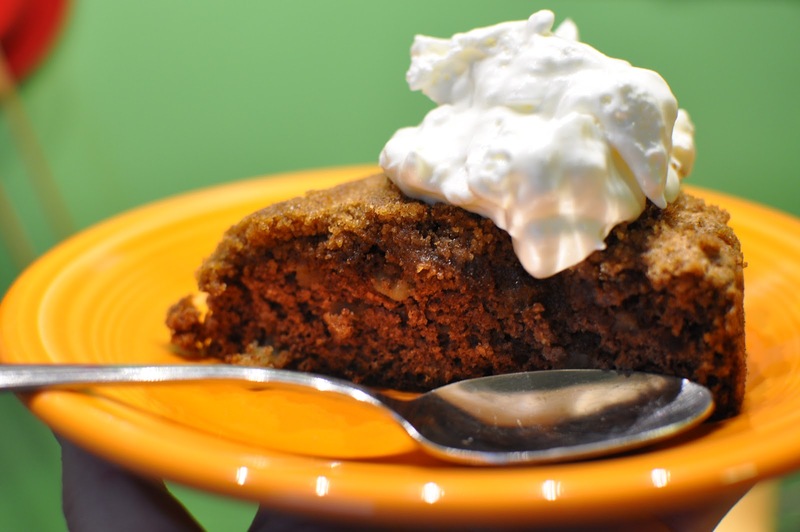 I used one of my Granny Smith apples for this recipe. 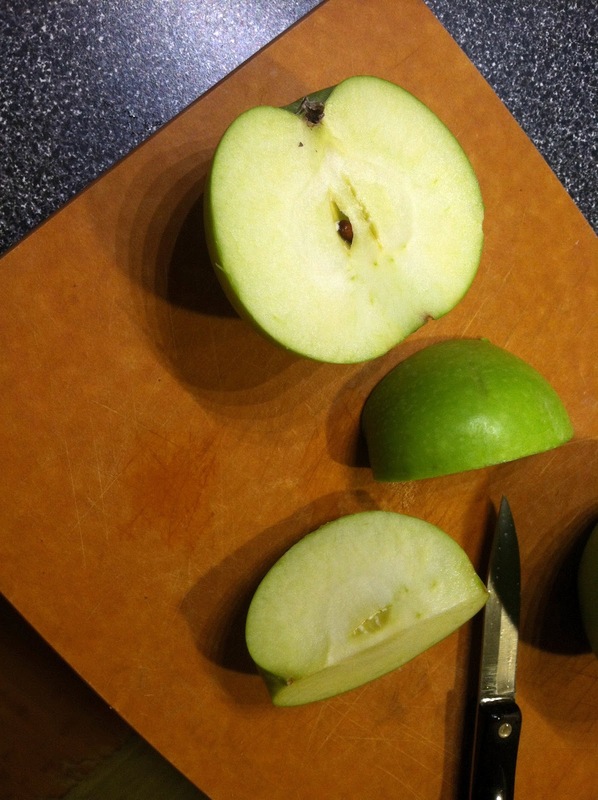 You will need about 1 medium to large apple for 1-1/2 cups. 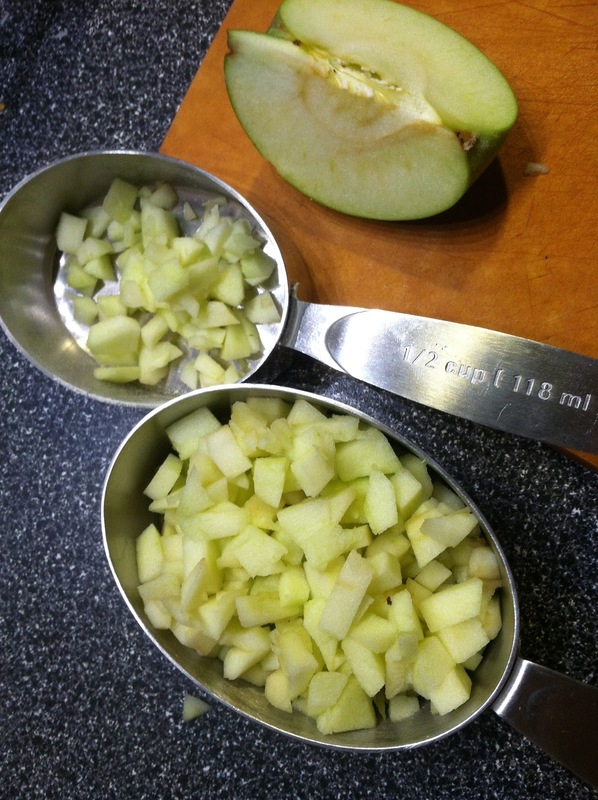 Combine 1-1/2 cup finely chopped apples and 1 egg in a bowl. 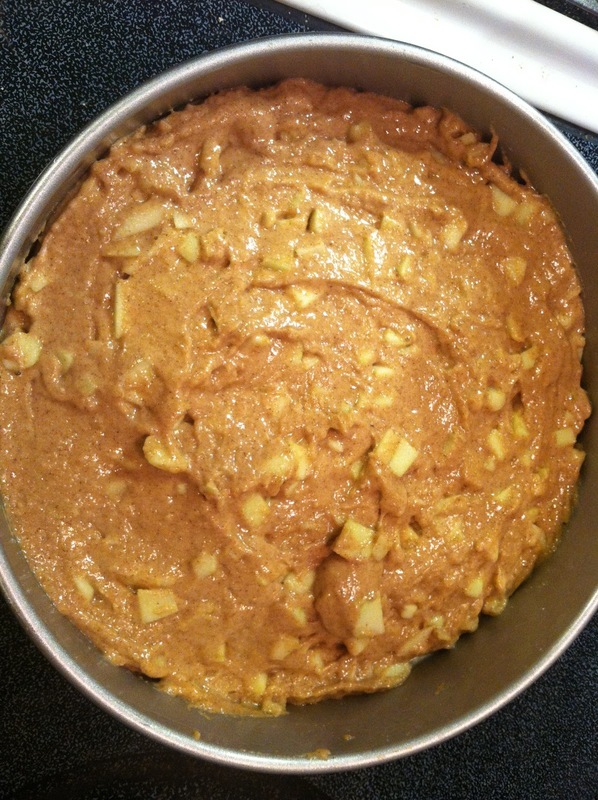 Mix in 1/4 cup applesauce. 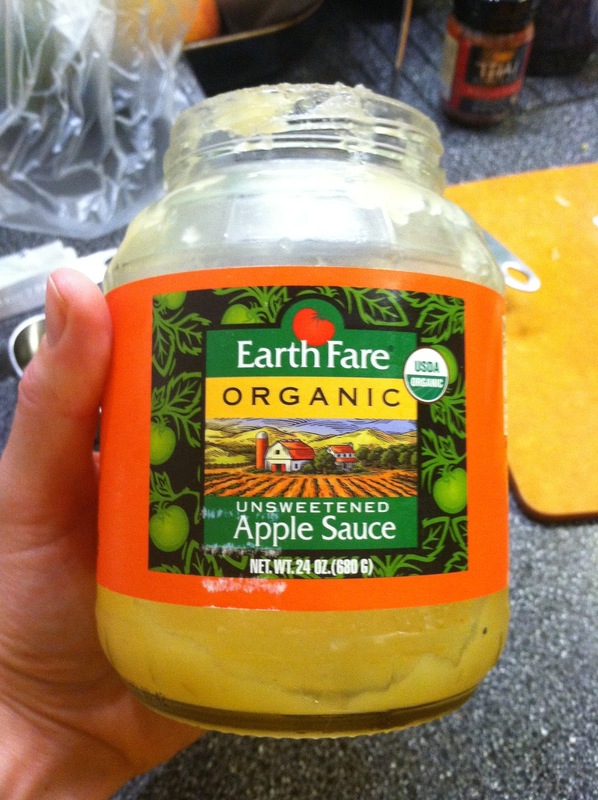 I love the Earth Fare unsweetened applesauce. This stuff is so good and the perfect consistency. Spread the batter in the prepared pan. This is a dense and thick batter. 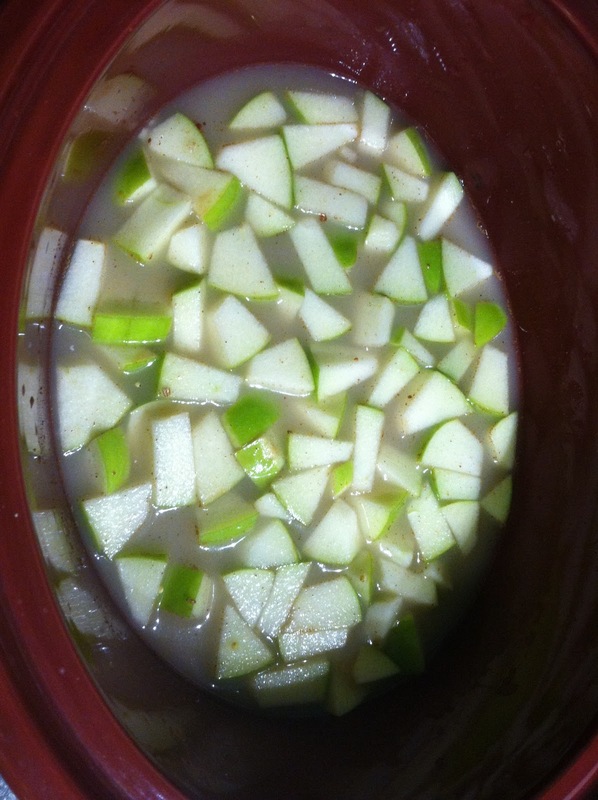 The apple chunks look good already. Now for the the topping. 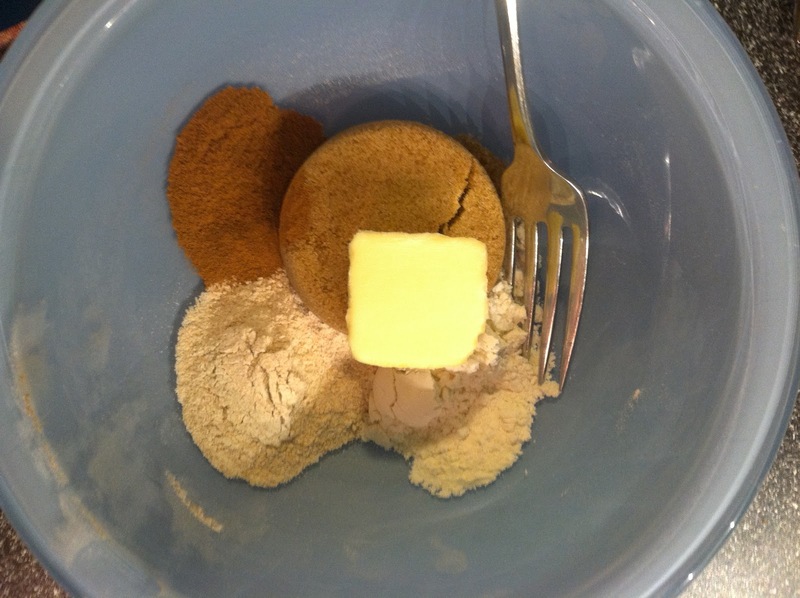 Mix together 1/4 cup packed brown sugar, 1 tablespoon whole wheat flour, and 1/2 teaspoon cinnamon. 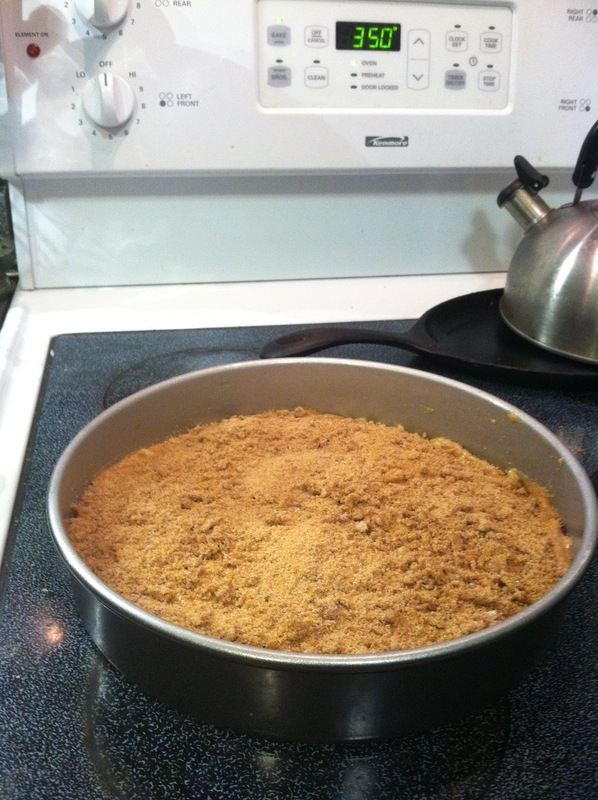 Cut in 1 tablespoon margarine until mixture resembles coarse crumbs. Sprinkle topping over batter in pan. Bake in a 350 degree oven for 25 to 30 minutes or until toothpick inserted in center comes out clean. Cool in pan for 10 minutes and serve warm. 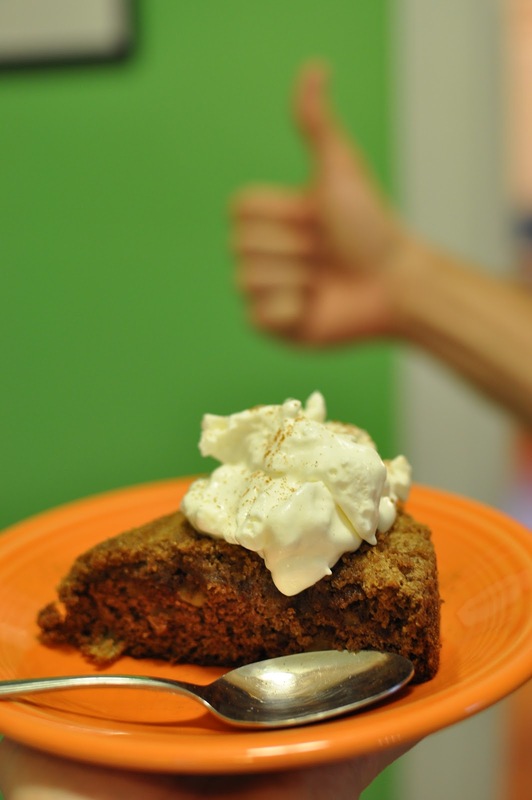 Coffee cake is truly the best when it is fresh from the oven. 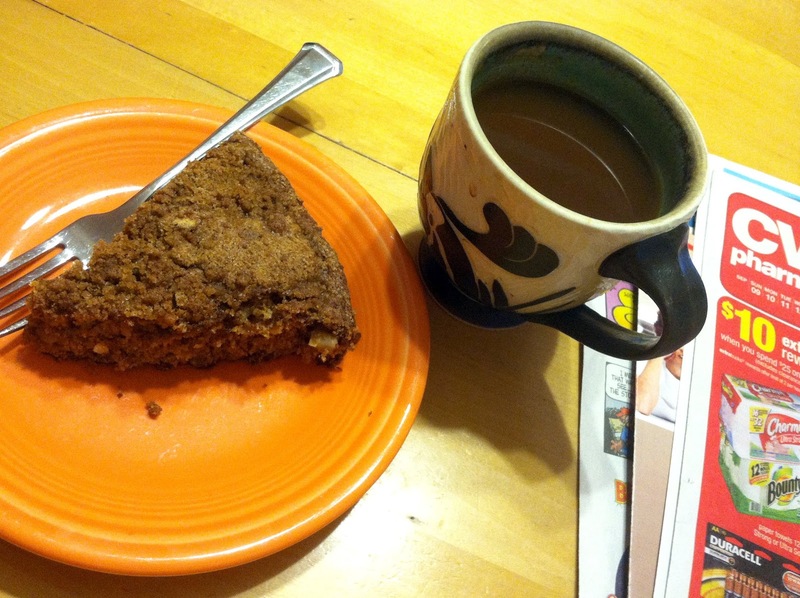 I prefer my coffee cake with my Sunday paper and hot coffee. Or if you are really daring, serve with whipped cream. I promise this coffee cake will not last very long. 1. Lightly grease a 9-inch round baking pan; set aside. In a small bowl stir together 2/3 cup flour, 1/2 cup whole wheat flour, 1 teaspoon baking soda, 1 teaspoon cinnamon, and 1/4 teaspoon salt. 2. 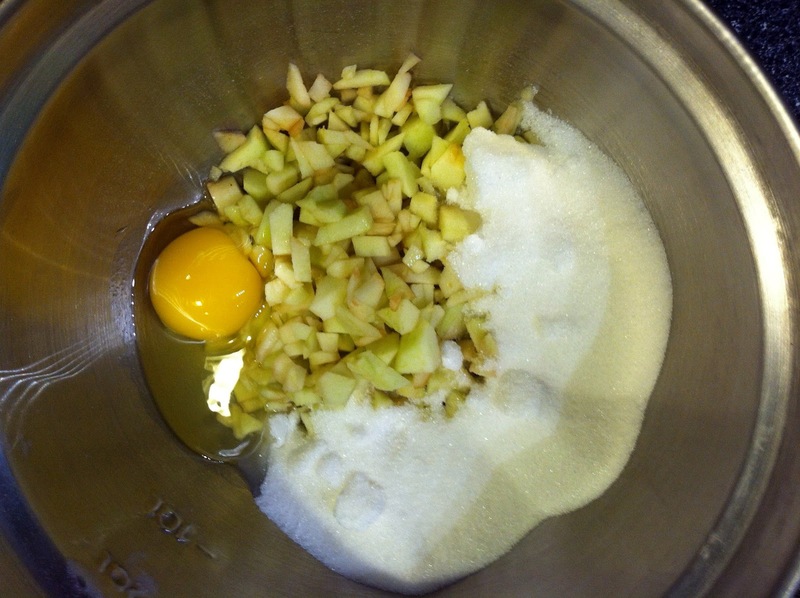 In a large bowl, combine 1-1/2 cup finely chopped apples and 1 egg. Stir in 3/4 cup granulated sugar and 1/4 cup applesauce. Stir in flour mixture. Pour into prepared baking pan. 3. 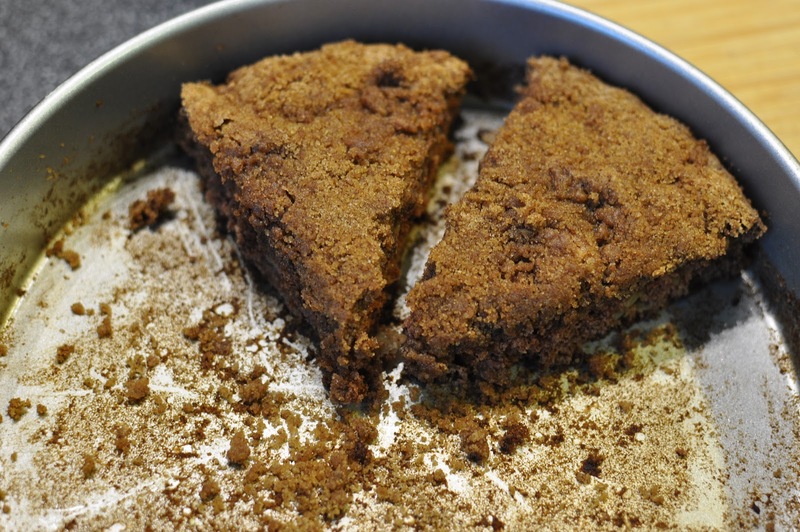 For topping, stir together 1/4 cup packed brown sugar, 1 tablespoon whole wheat flour, and 1/2 teaspoon cinnamon. 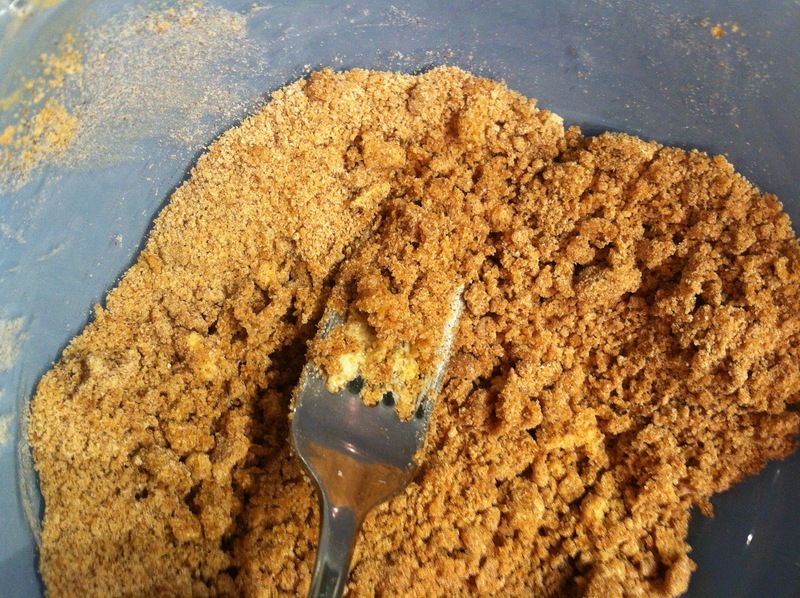 Cut in 1 tablespoon margarine until mixture resembles coarse crumbs. 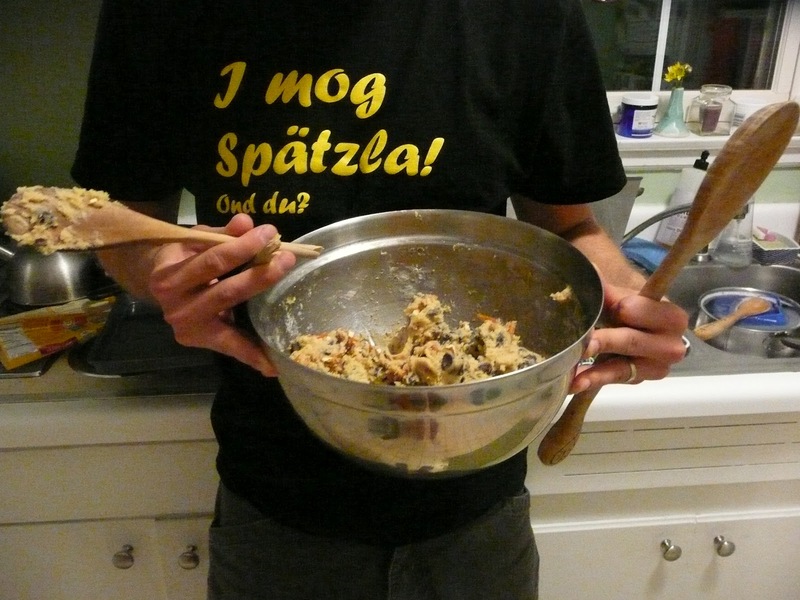 Sprinkle topping over batter in pan. 4. Bake in a 350 degree oven for 25 to 30 minutes or until toothpick inserted in center comes out clean. Cool in pan for 10 minutes and serve warm.